Meet our Year R Team, we are looking forward to working with you and your children this year. 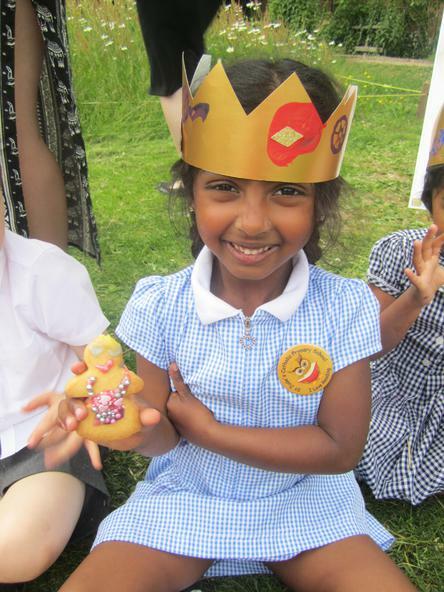 We hope you will enjoy being part of our learning journey this year. 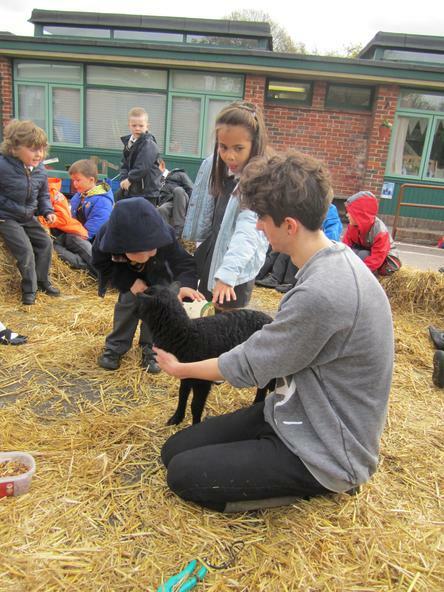 In Reception we use the children's interests to form our curriculum. 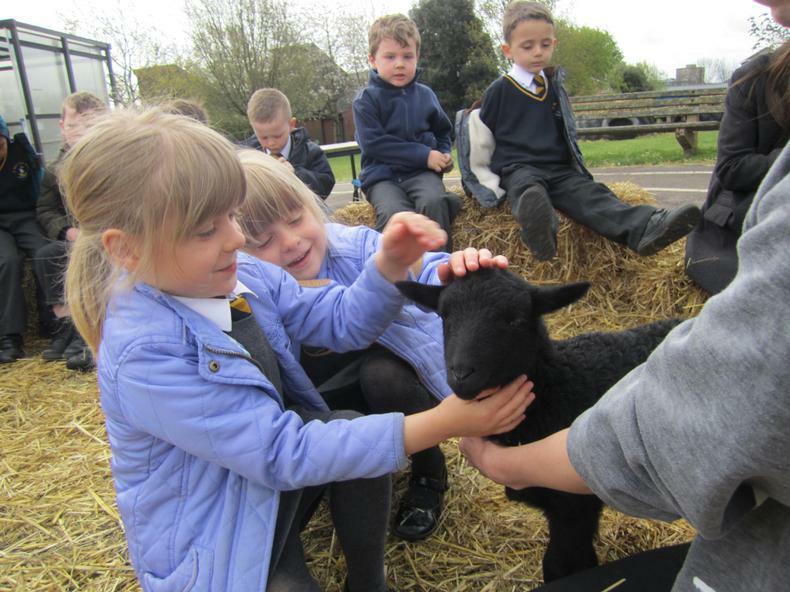 We work as a team to ensure we are constantly updating our exciting environment to respond to children's interests and next steps in learning. 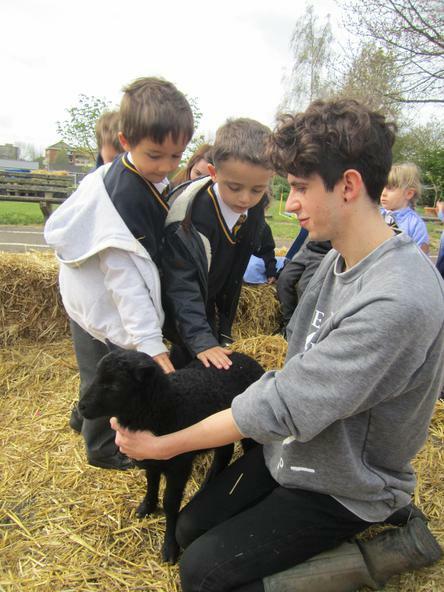 We can't believe we've come to the end of the school year and just how far the children have come during their first year at St Judes. 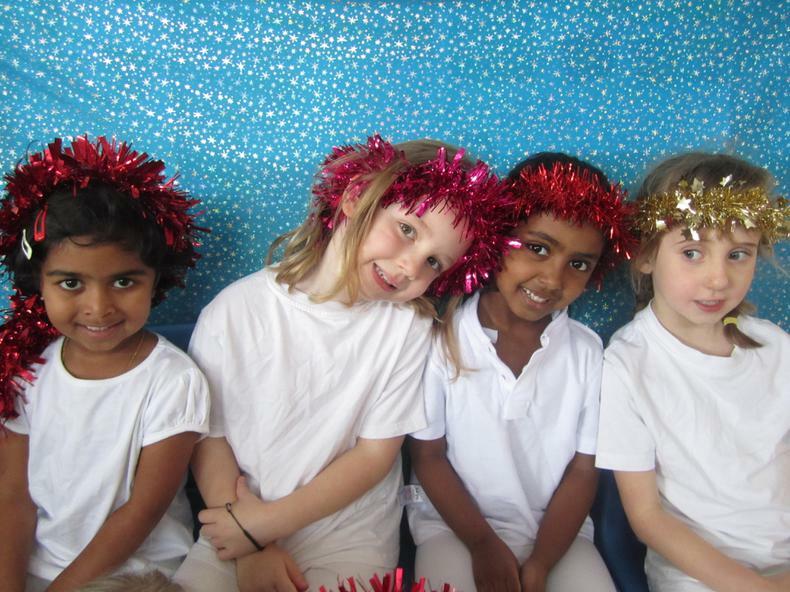 We are really proud of you and know you will be fabulous Year 1s! 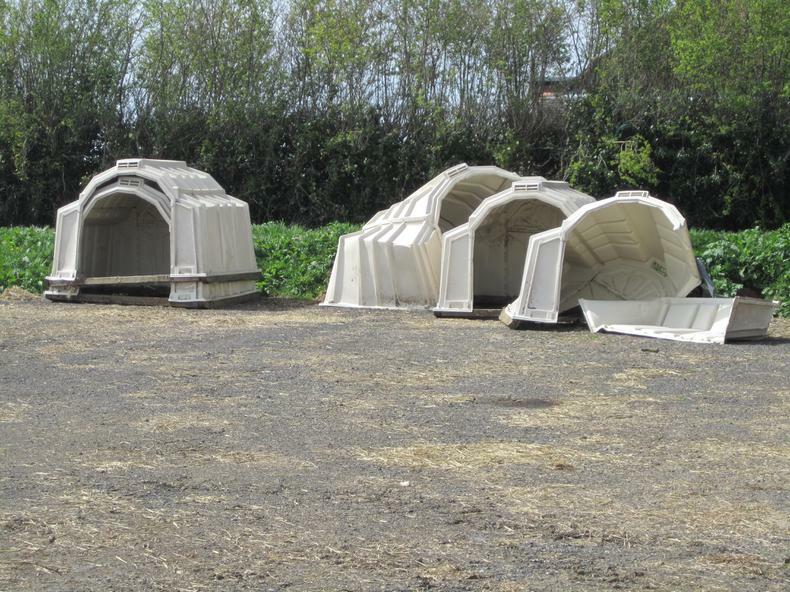 The chickens have arrived! 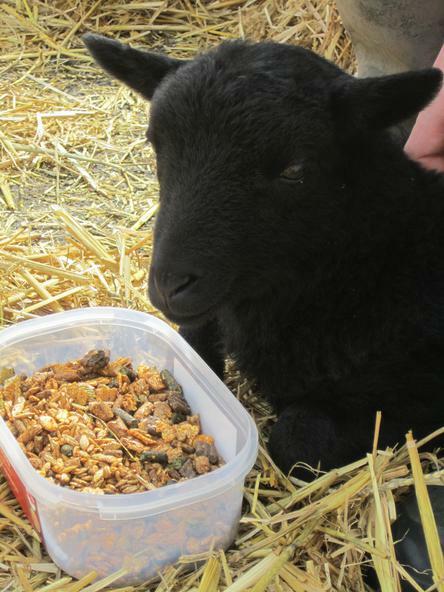 We are so pleased that they will be living by the meadow in our area! 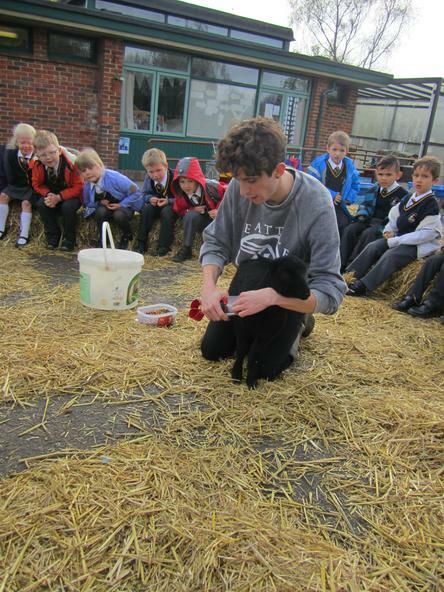 We've been able to watch them every day and Mr Morgan gave us a special talk about how to look after them. 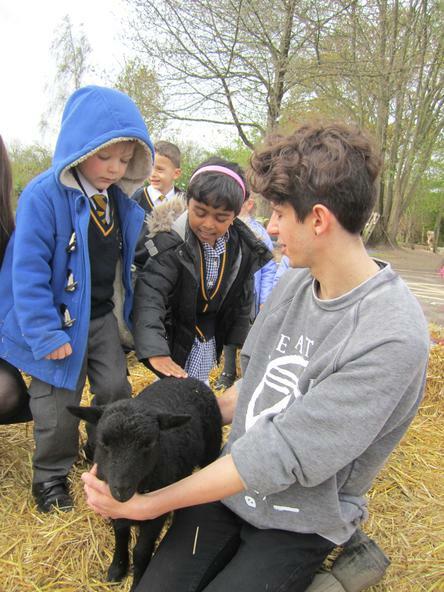 The children were able to stroke the chickens and ask lots of questions. 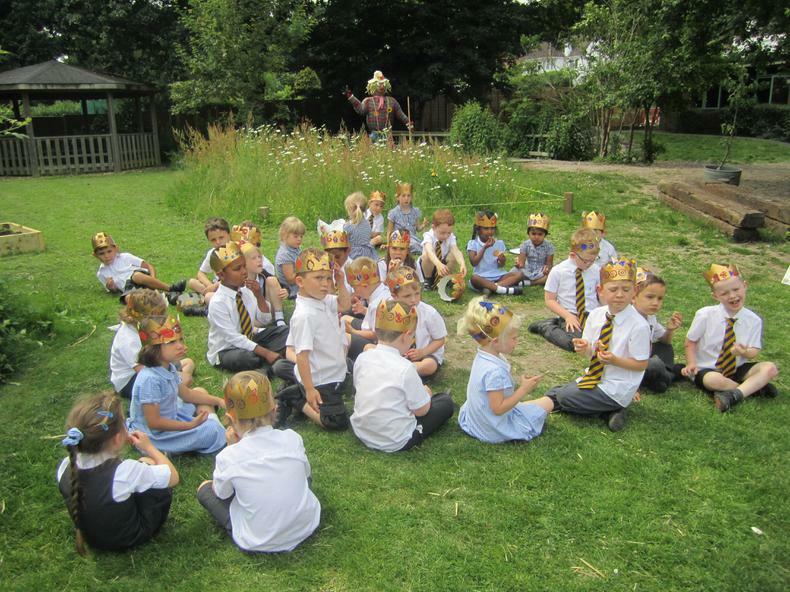 We have had a very special time welcoming the new children into our class. 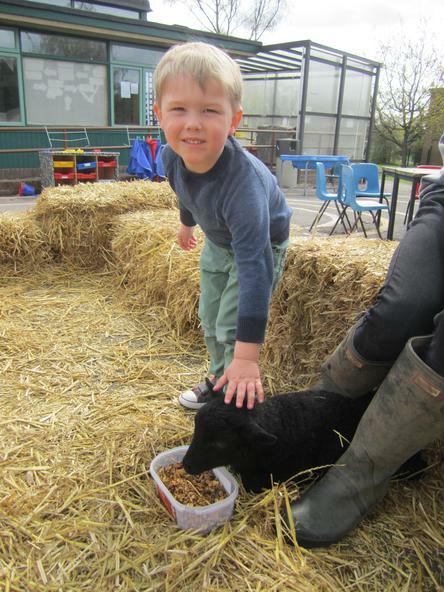 We've had lots of shared playtimes with the children from Jumping Jacks preschool, stay and play sessions with all the new children; and finally a wonderful teddy bears' picnic with a teddy bear hunt, circle and parachute games and finally a fantastic picnic. 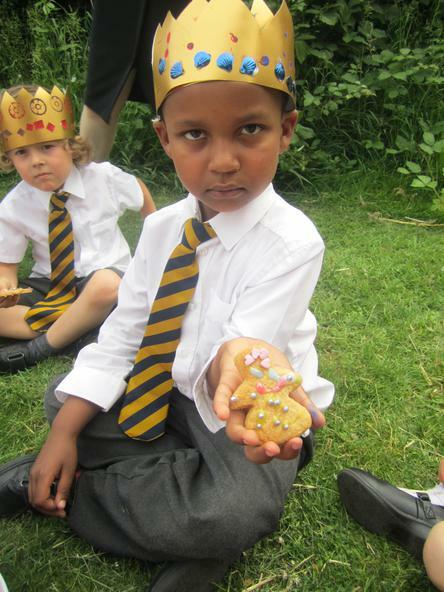 The Reception class made it all with teddy bear biscuits and cakes for us all to share - and not a single crumb was left! 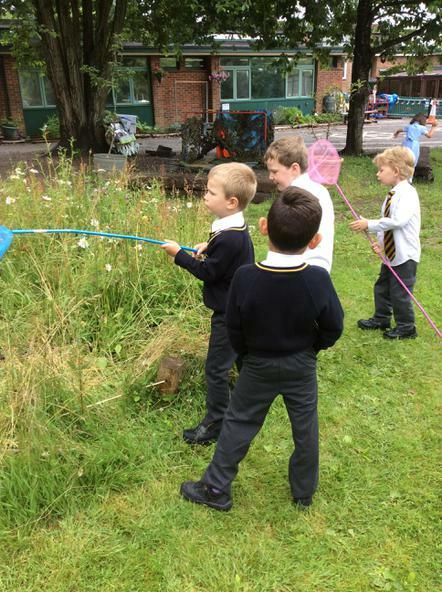 The Reception class have been reading lots of books by Eric Carle and we've had lots of bug hunts around our playground and in the wild flower meadow. 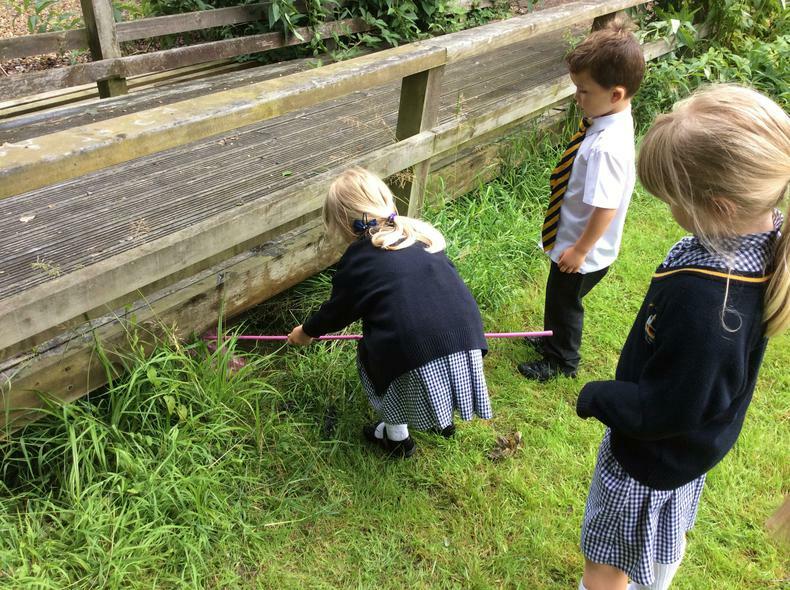 It's been great looking at all the different mini beasts we could find and making tally charts. 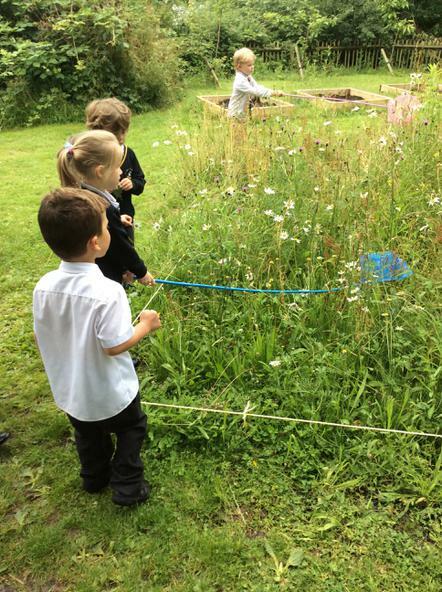 The children worked together to make a giant butterfly using the pallets and tyres. They arranged the building blocks to create symmetrical patterns on it. 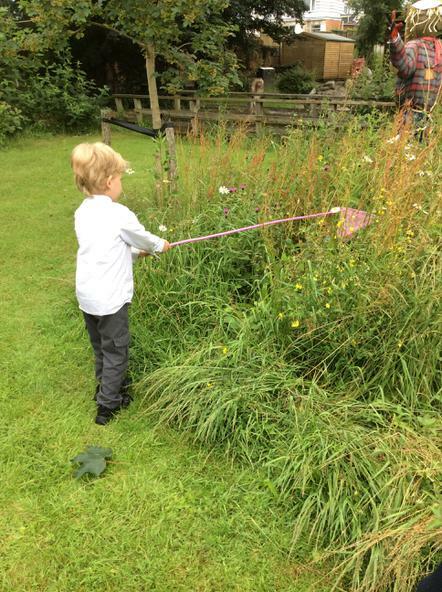 They pretended they were flying on the gigantic butterfly - where could we go? The very hungry caterpillar becomes the Gigantic butterfly! Yesterday was the Queen's 90th birthday and we had a very busy day to celebrate this special event. 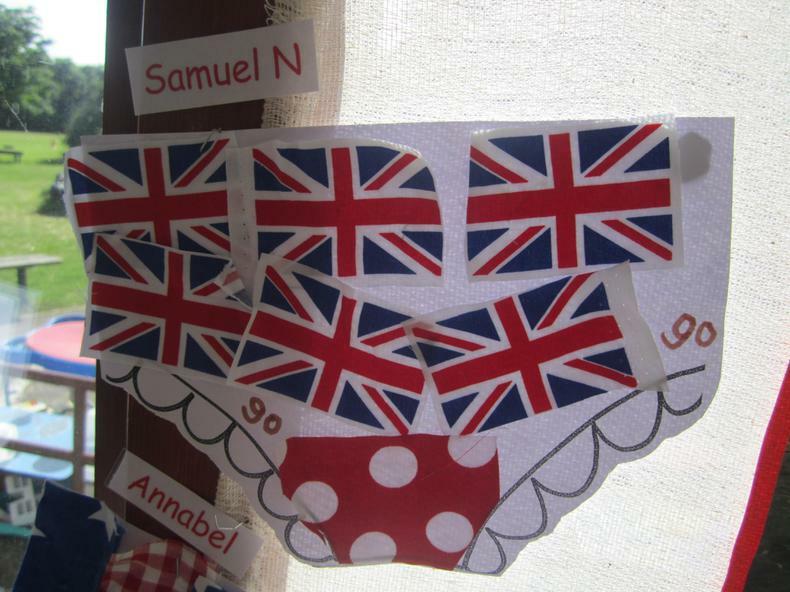 The children were very industrious in the morning printing crowns to wear for our school picnic to mark the occasion; printed the Union Jack flag; we read the story "The Queen's Knickers" and the children each made a pair of Royal knickers for the Queen but they had to make sure they had a Union Jack on it as Elizabeth ll is the Queen of England. 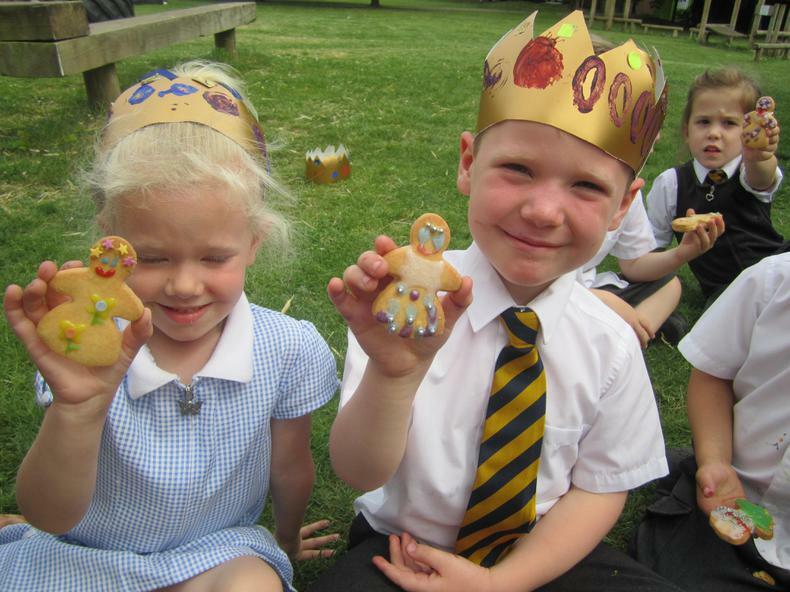 All the children iced biscuits to look just like a queen - they did an amazing job taking great care with icing and decorating them. 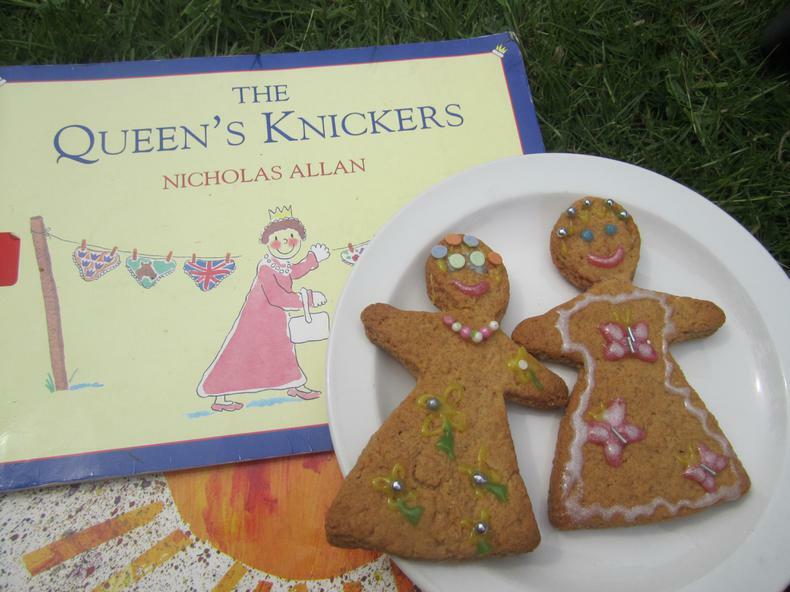 We all agreed Miss Salussolia's biscuits looked fit for a Royal Bake off. 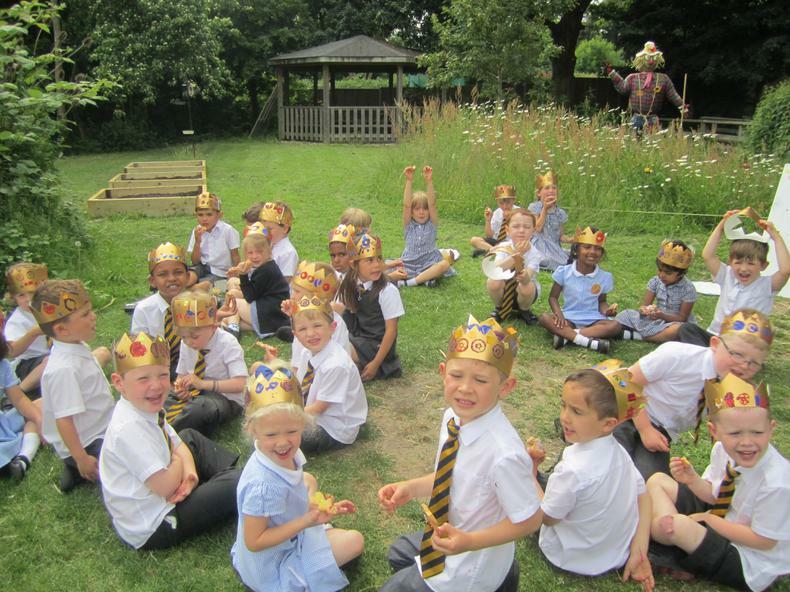 We ended the day by sharing a story and eating our biscuits by our beautiful flower meadow. 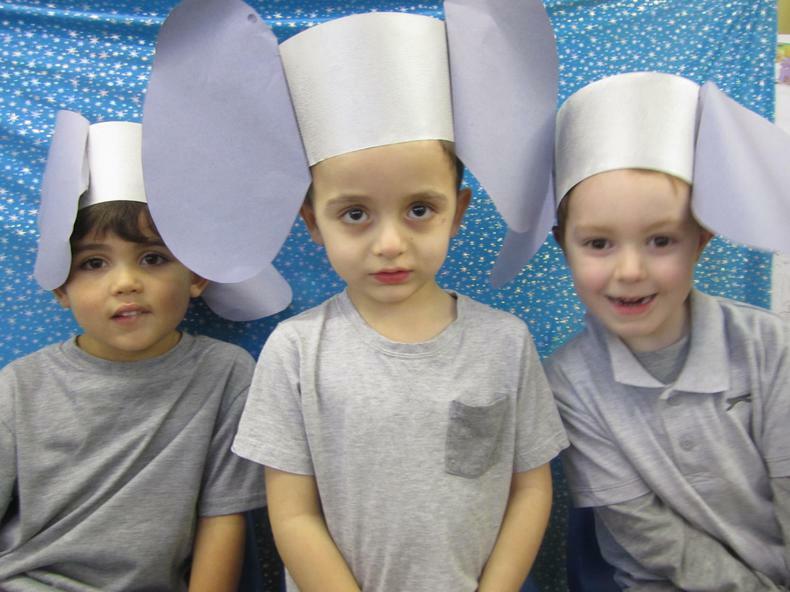 What an exciting half term we've had in Reception. 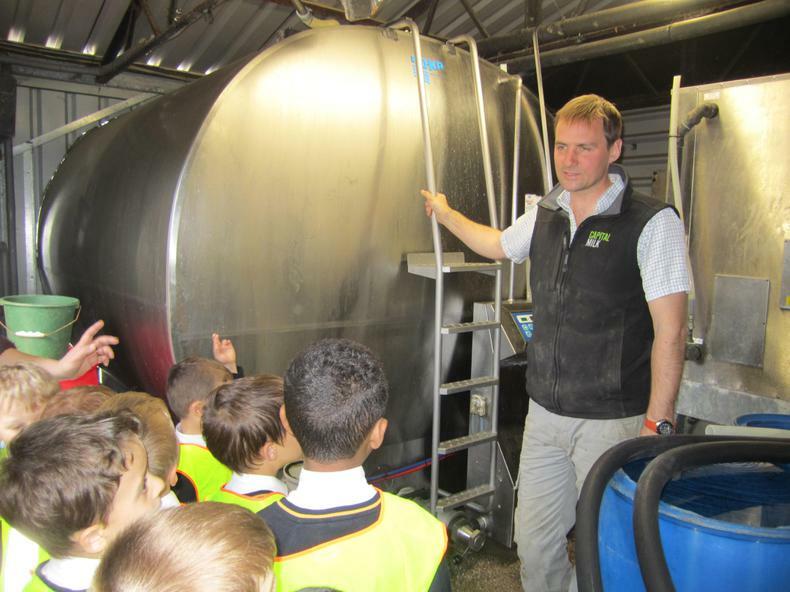 We had a fantastic trip to a local farm and learnt all about where milk comes from. 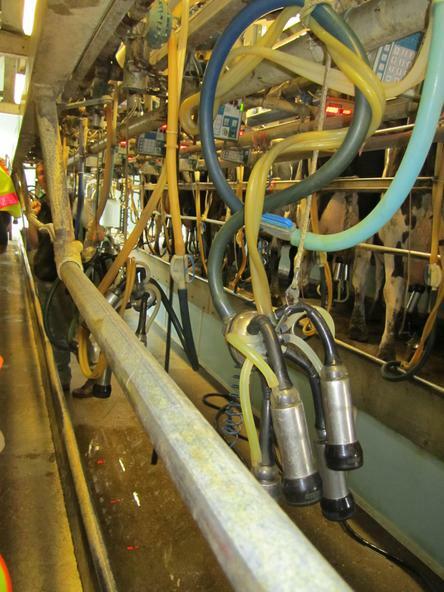 We watched the cows come into the milking parlour and Farmer Sam explained how the milk is sucked through the clusters into tubes going up to the ceiling and we were able to follow the pipes through to the next room to a huge tank to where the milk is stored for the milk tanker to collect it and take it to the dairy. 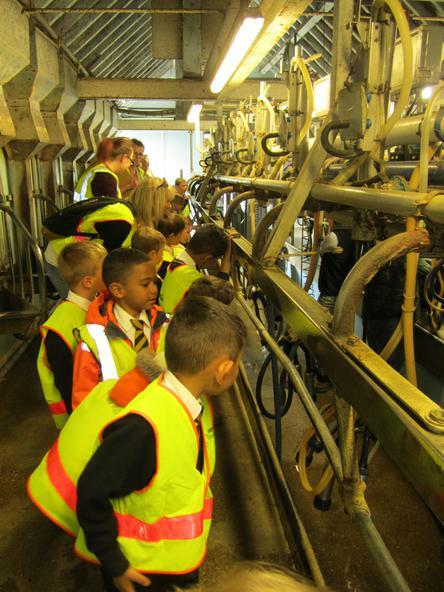 The children thought it was very funny to see the cows kick the clusters off once the milking had finished, and were very interested to see how their udders were sprayed down afterwards to keep them clean and healthy. 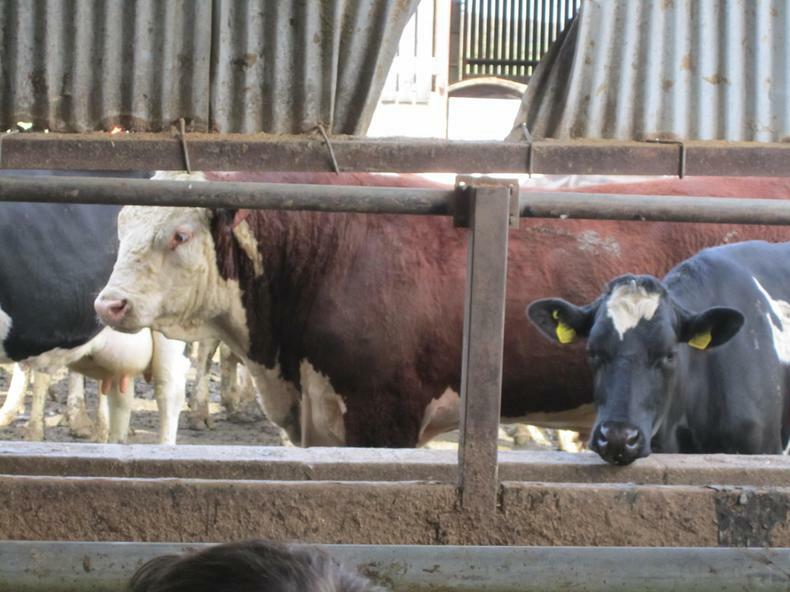 We learnt how each cow has a passport - they are each given a yellow tag on their ear with their own passport number on so they can be tracked. 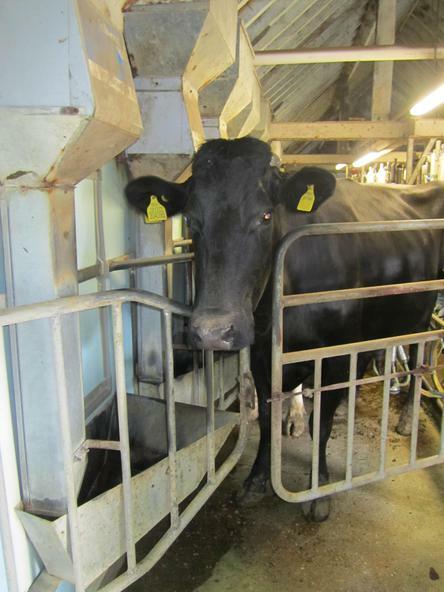 We visited the cows' winter barn where they each have a stall for the winter and the machine that goes up and down on a chain to scrape away the mess. 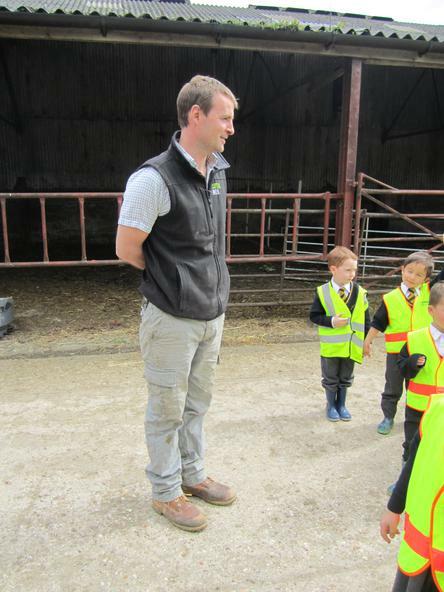 Farmer Sam explained all about how the manure is used on the fields to help grow the grass the cows eat and how much water they need to make the milk they give us. 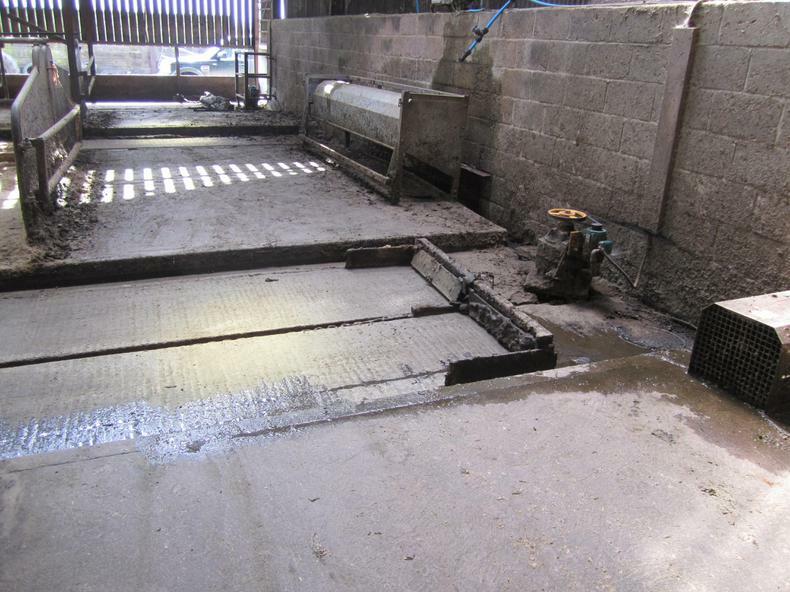 We saw the foot bath the cows go through to keep their hooves clean too. 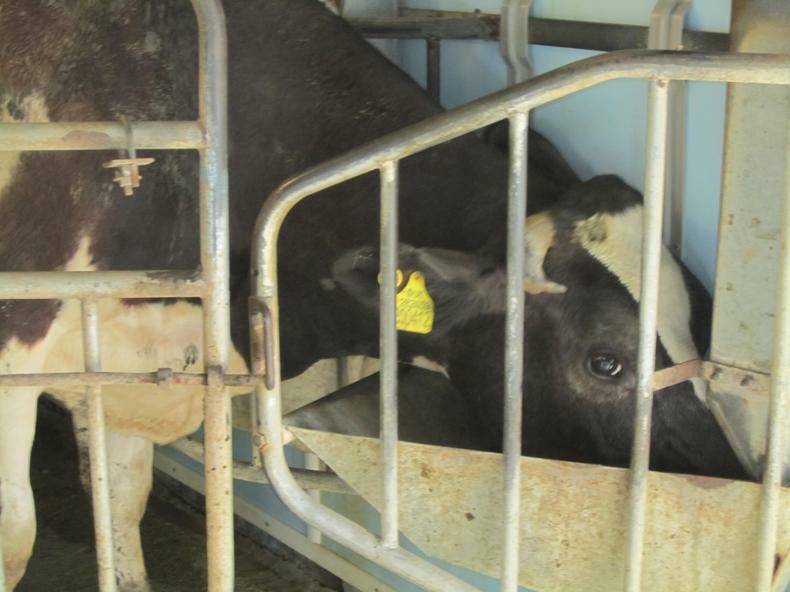 We saw the "hutches" the calves keep warm in together when they are very young. 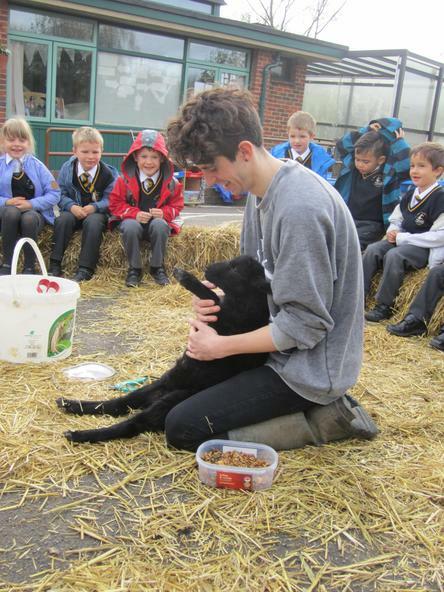 We even met Harry the bull - he's 4 just like some of the children in our class! 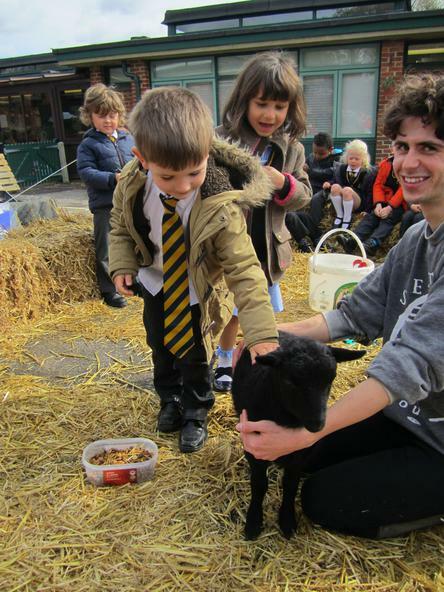 We had our very own farm in our playground complete with hay bales and the children made sheep and our own cow who the children named "Daisy Rattle". 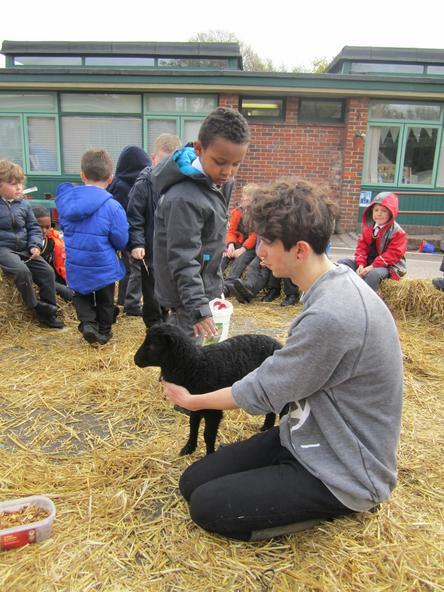 Each day the children carefully arranged the animals in their stalls and made beds for them in the straw and had lots of fun riding round on all of the horses. 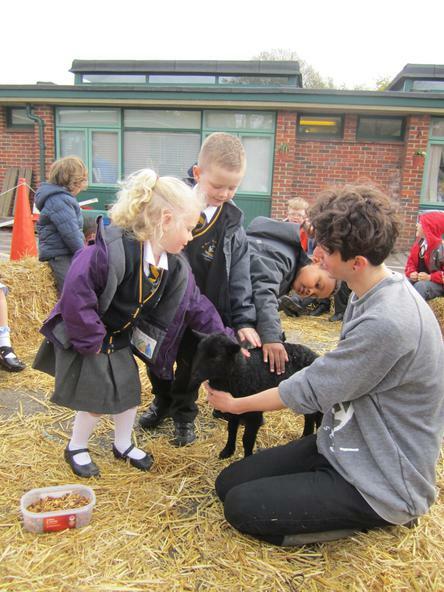 We even had our very own tractor, and the children could pretend they were taking the straw bales to wherever they wanted to go! 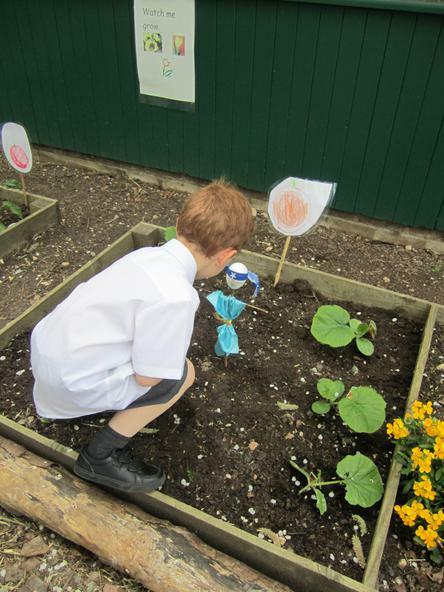 The children have been very busy planting all sorts of things in our vegetable beds - carrots, spring onions, radishes and beetroot, and have made special signs so we know where they all are and what's coming through. 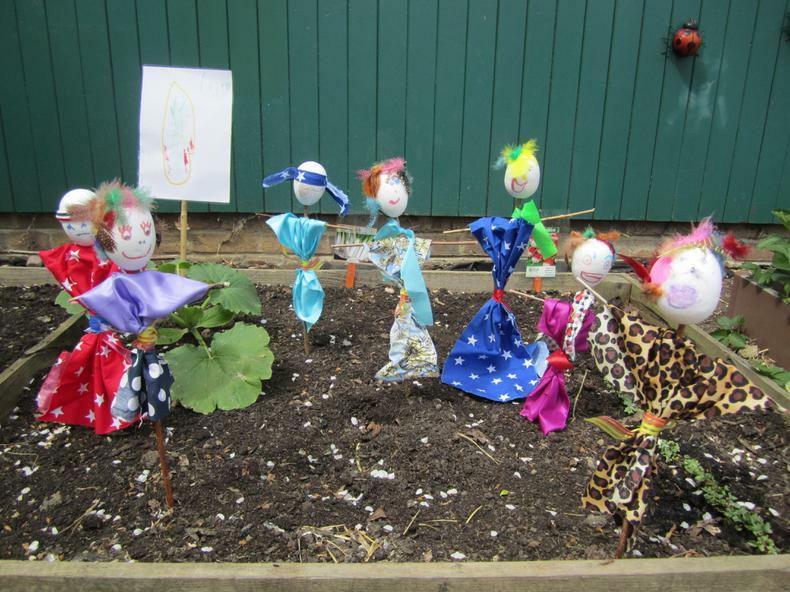 The children have spent a lot of time watching the wild flower meadow changing as the plants have grown very quickly during April and May, and a scarecrow has come to watch over them. 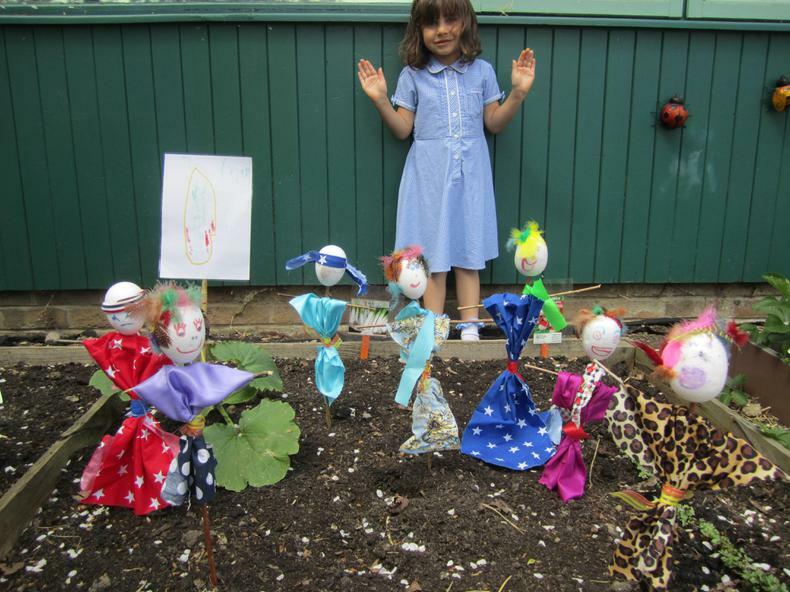 The children have loved him and so wanted to make their own to go in the Reception garden - they've made some amazing little characters. 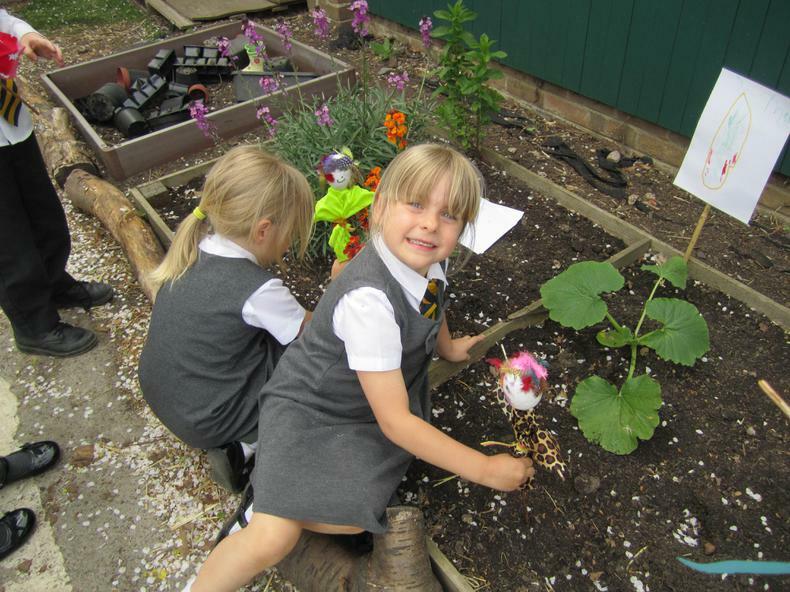 We've continued with our theme of traditional stories and focussed on "Goldilocks and the 3 bears" and "The 3 little pigs" with lots of building outside with the bricks and inside with junk modelling. 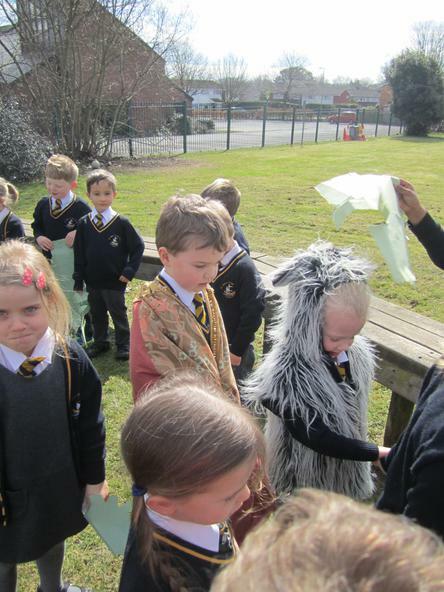 Over the term the children have explored ways of joining junk to make different things and have gone on to make houses for the 3 little pigs. The children have learnt how to wrap boxes with paper which they've printed to look like their chosen little pig's house and then cut flaps for doors and windows. 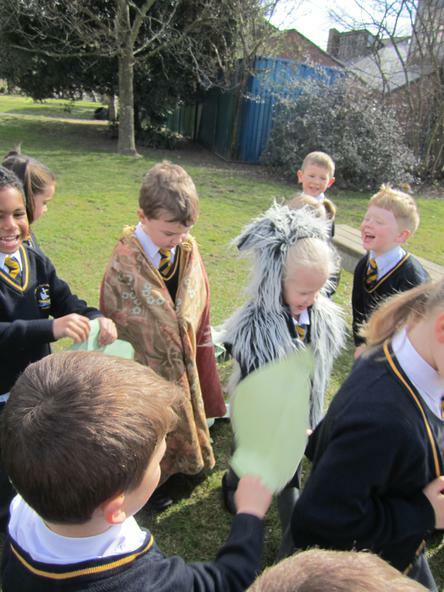 The children noticed some changes in the stories we read - one had a girl pig, so the children wanted to make changes to the stories themselves, so we talked about who they would rather meet - a big bad pig or a happy wolf? 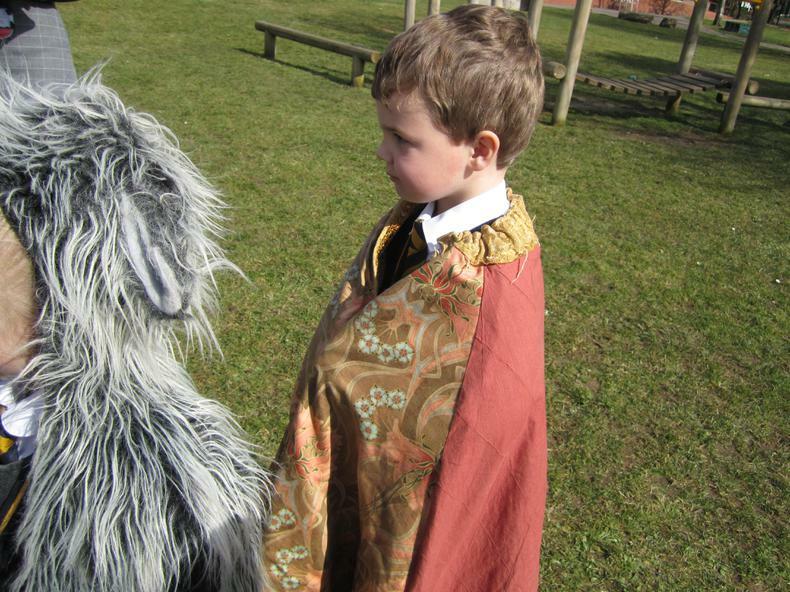 We had some great ideas - a wolf with funny big feet, or one who is a rock star. Joshua even painted a happy wolf playing the piano! 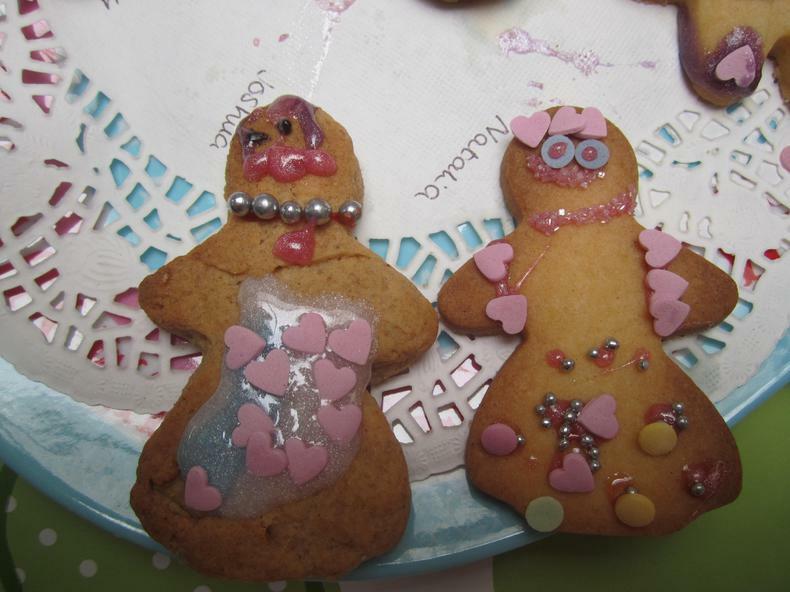 Of course we have done lots of cooking - little pig cakes and pizzas and we've made lots of smoothies. We made milkshakes with treats - biscuits and ice cream in as well as healthy choices with fruit and yogurt. 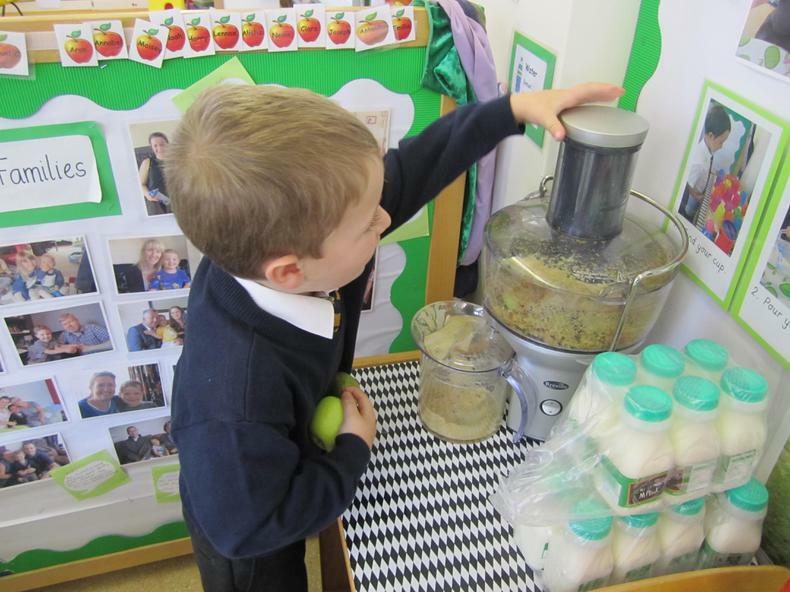 The children loved them and have used the food processor, blender and juicer. We've used ICT in other practical ways too - not just the computers, by learning to use the beebots. The children have really enjoyed these, programming them to make little trips in front of them. Give us a fresh start and love in our hearts this Lent. 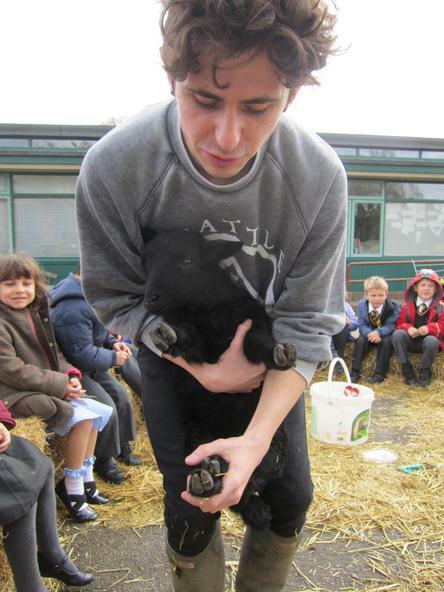 Keep us safe and love us forever. They have loved bringing our class lent books home adding their own thoughts and prayers as we went through Lent and prepared for Easter. 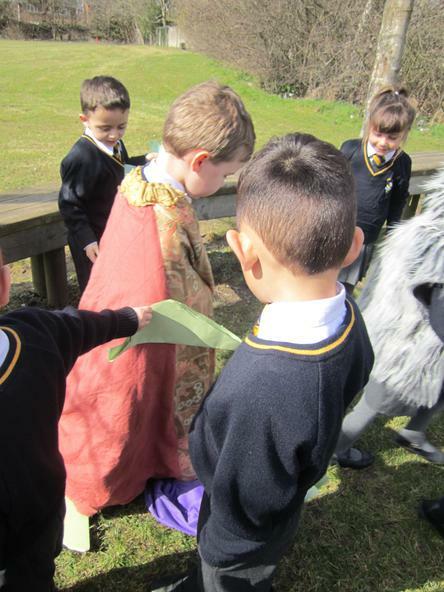 Throughout Holy Week the children have acted out parts of the Easter story. 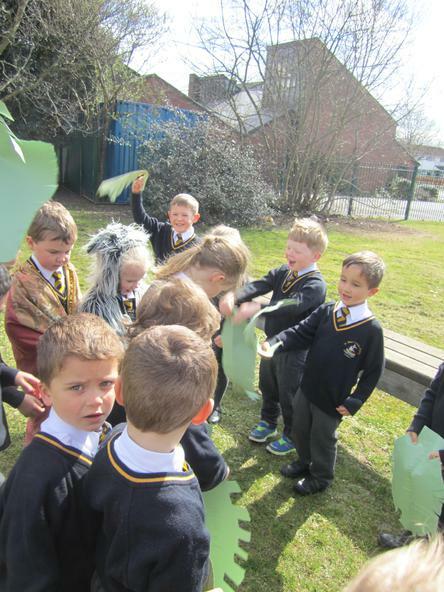 They made their own palms and we went outside to welcome Jesus on his donkey, shouting Hosanna, waving their palms and laying the palms and some of their cloaks down for Jesus to walk over. 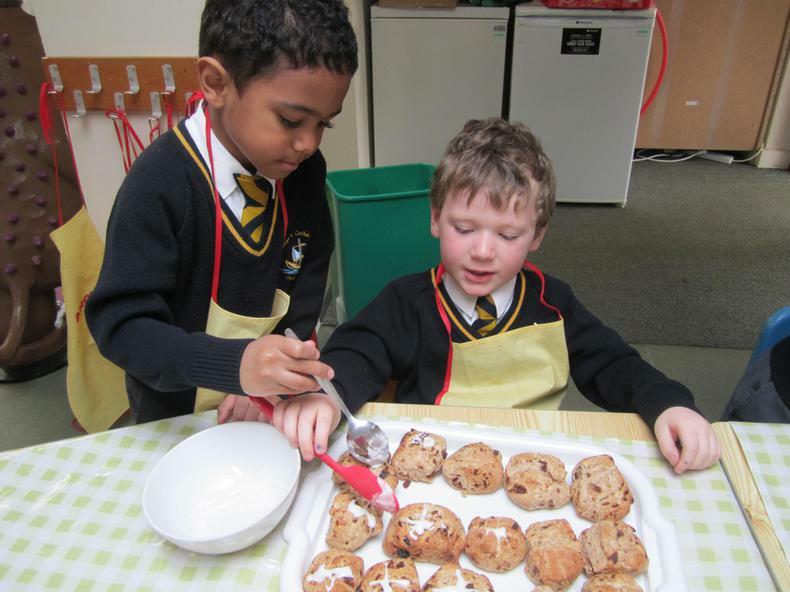 The children made hot cross buns - and this involved lots of skills which the children have been learning over the term. 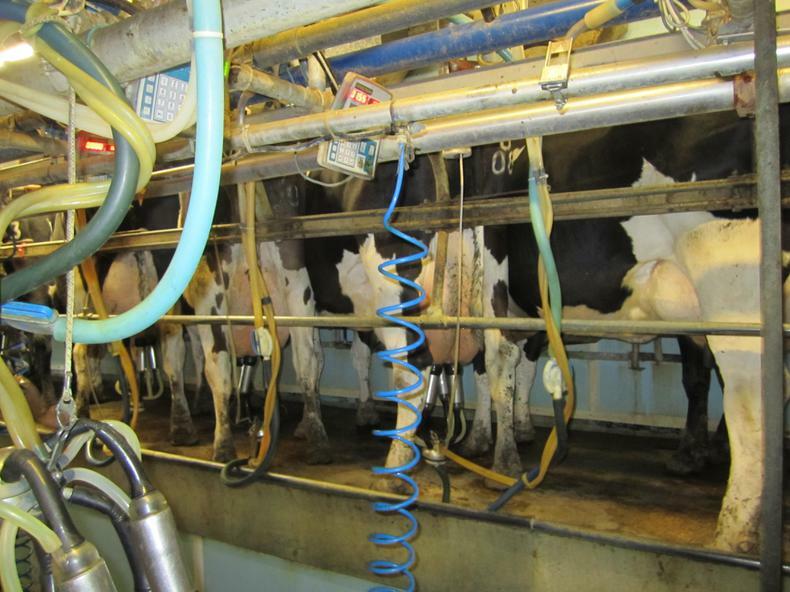 They have learnt how to measure out a level spoonful - wiping the excess off against the bag as their partner holds it, or wiping it off with their finger if it's just a teaspoon full. 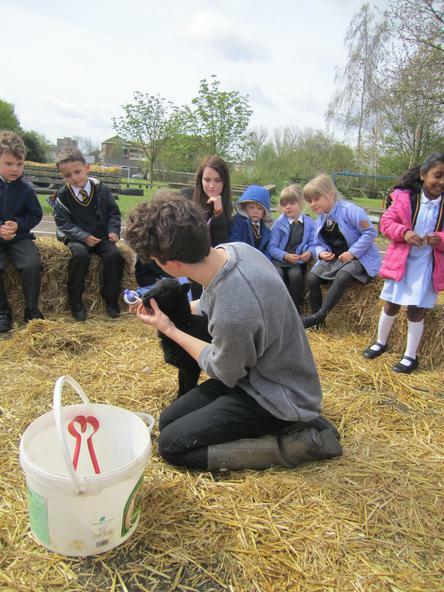 The children are learning how to break an egg - some of them can now do this with quite a flourish! 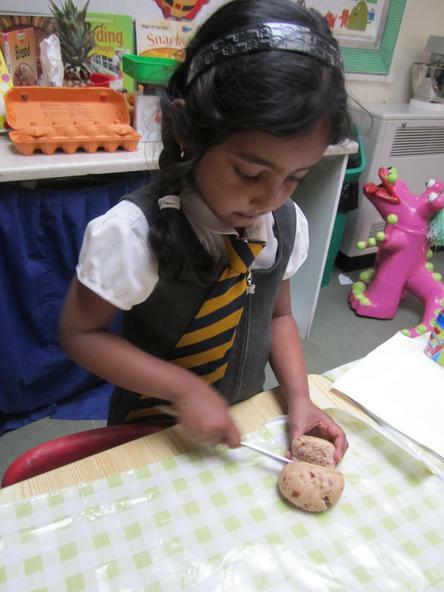 Kneading bread was the new skill they learnt with this recipe and the children found it helpful to say "Push, fold, and turn" as they kneaded the dough. 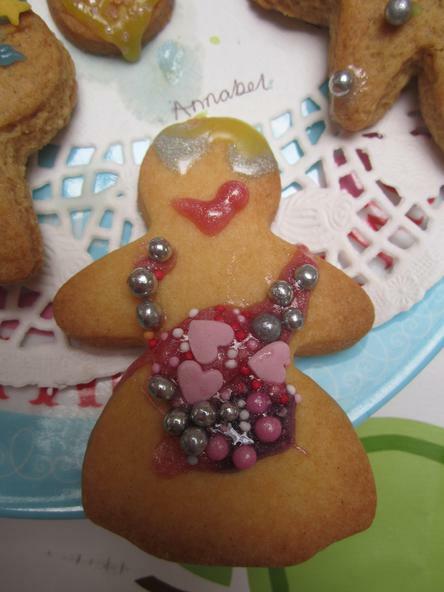 They then cut a cross shape onto the top of the bun and once it was cooked they carefully iced them - this was tricky as they had to hold the spoon a little way above then buns so that the icing drizzled over it...delicious! 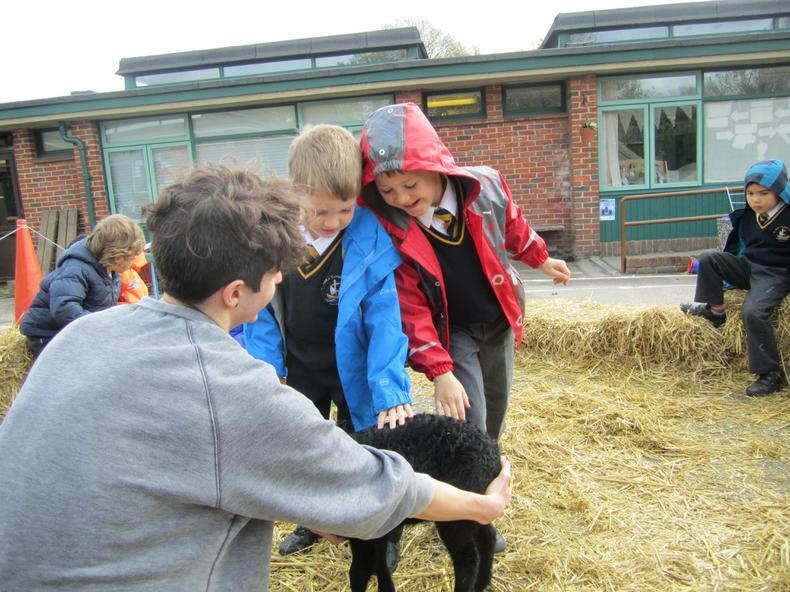 What a busy half term we've had. 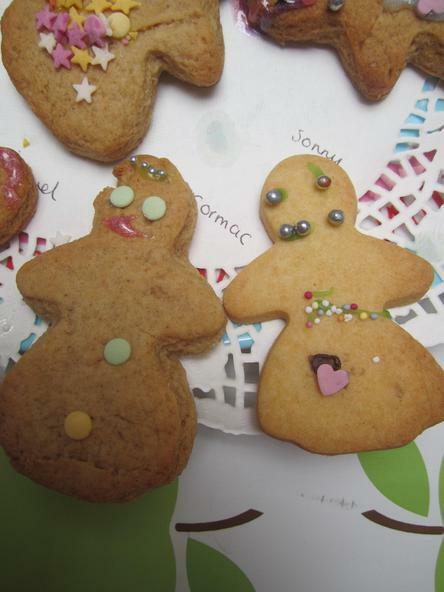 We've been focussing on traditional stories particularly The Gingerbread man and Goldilocks and the three bears. 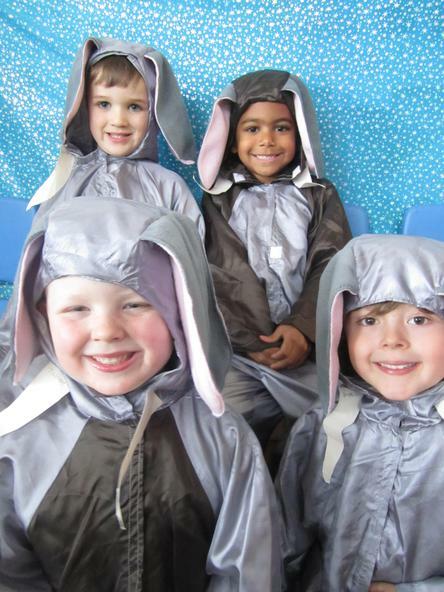 Every day the children have retold the stories using actions and have really got to know the stories and we regularly hear them retelling parts of it around the classroom. 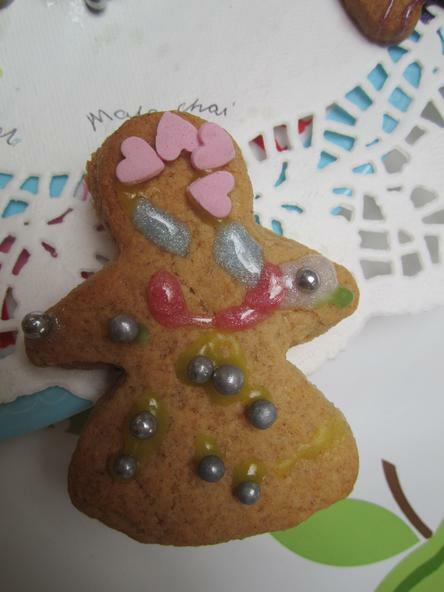 Run run run as fast you can - you can't catch me I'm the Gingerbread man! 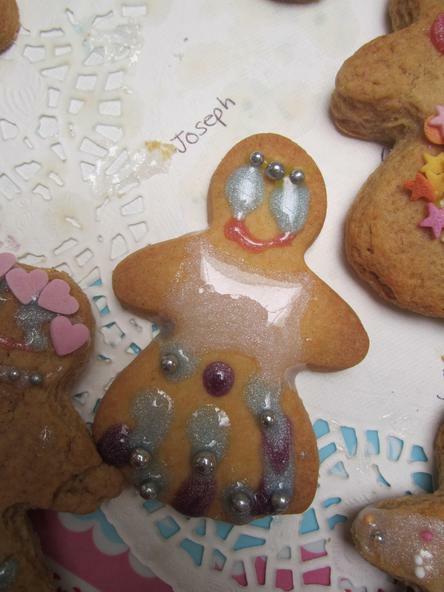 The children have done all sorts of cooking to go with it - making puffy paint in the microwave, salt dough gingerbread men for our bakery in the classroom and then of course making delicious gingerbread to eat. 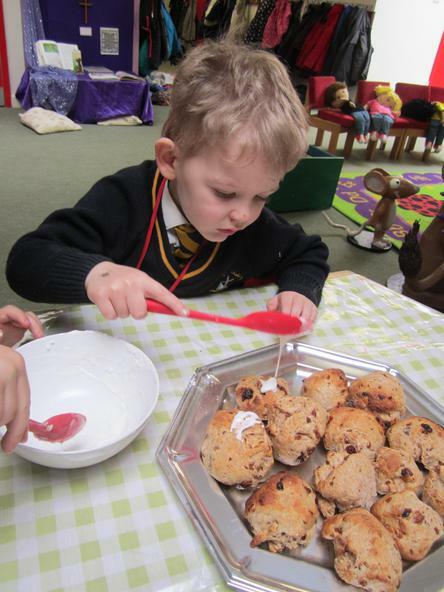 The children had to use all kinds of skills - cutting the butter ready to weigh it out, turning the spoon as they added the syrup and making sure they added level tablespoons and teaspoons of flour and ginger - tricky stuff! 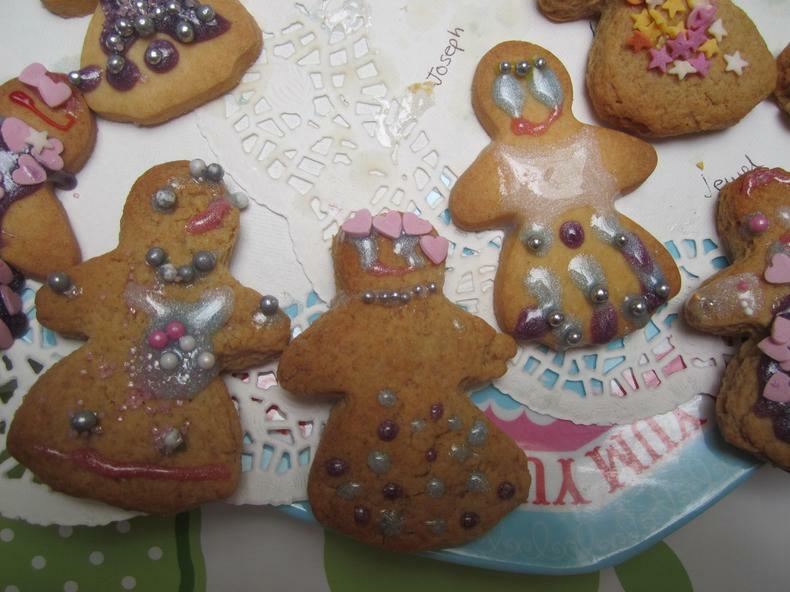 And of course we had to decorate them with raisins just like the old woman in the story. 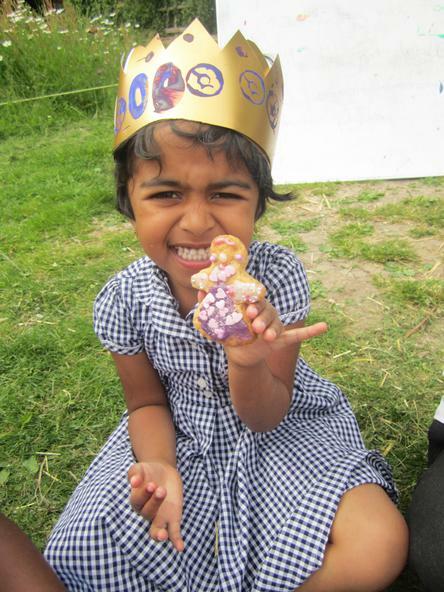 And even an amazing fox - straight out of the gingerbread man. 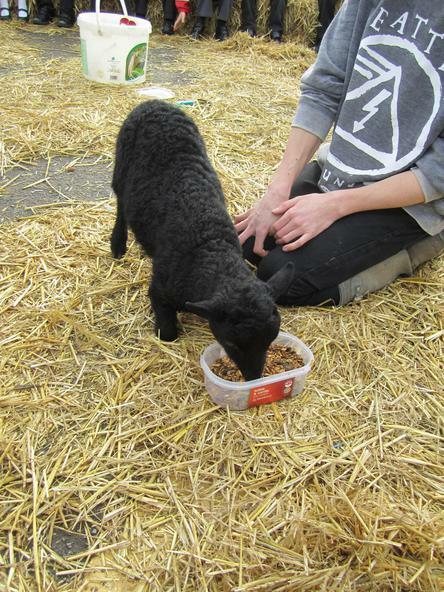 The only help this little girl had was to cut the legs! 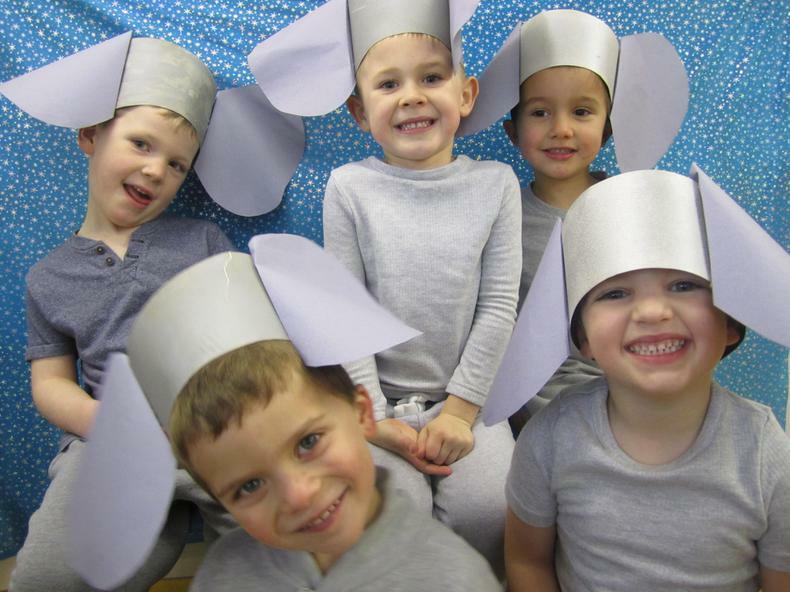 This week we have been performing our Christmas play "A present for the Baby" and the Reception class were dancers and elephants who came to see if they could make the Baby Jesus stop crying! All of our children did really well and it was very exciting coming back to school in the dark to give a special performance down in St Philip Howard's Church. 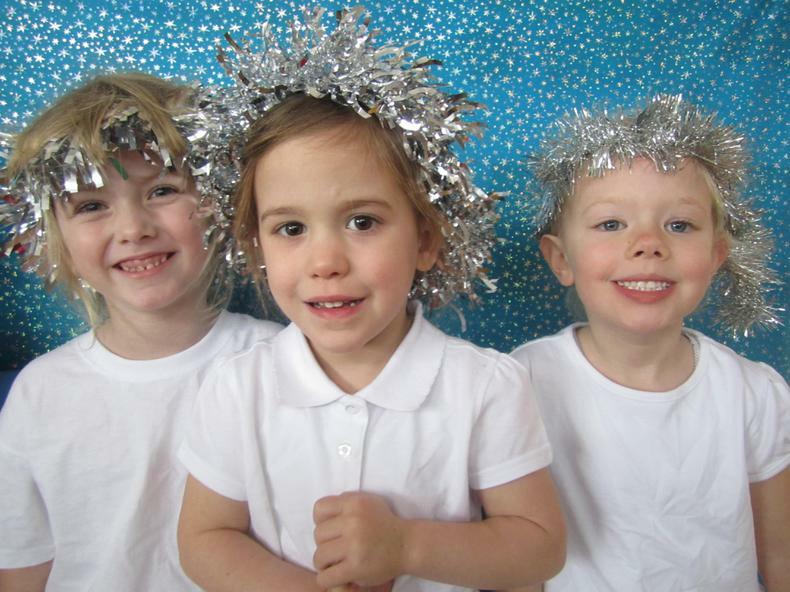 What a magical way to end their first term at school - well done everyone! 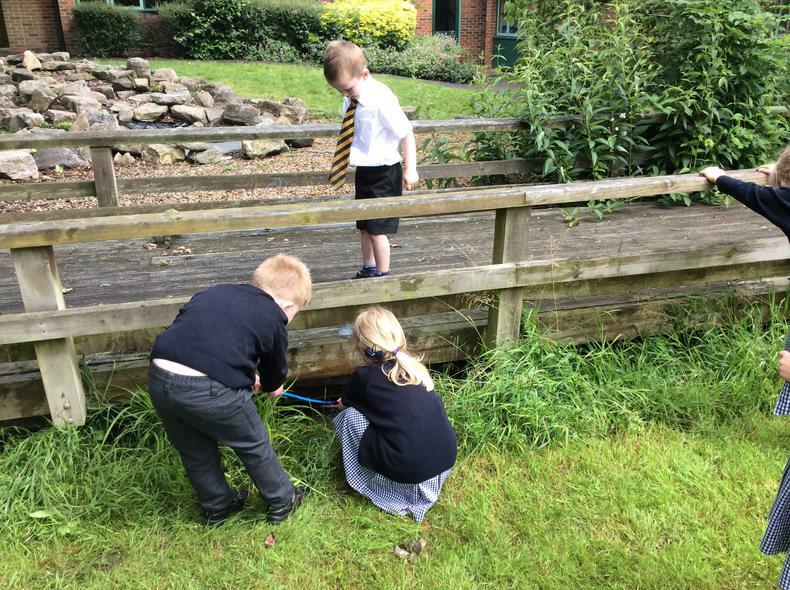 They have loved exploring how far they can make water travel using the gutters - and this has presented it's own challenges - how do they catch the water at the end? 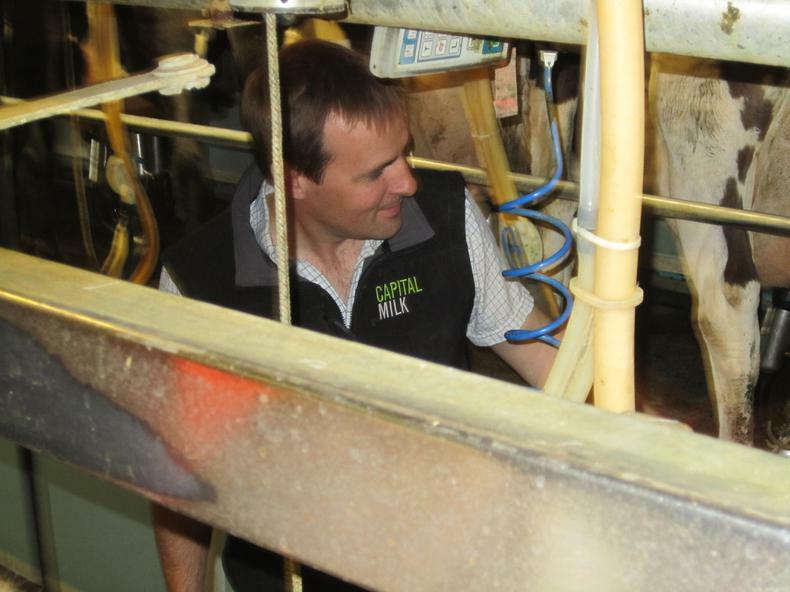 It's taken a lot of negotiation and readjusting of buckets...it's been great fun! All of this has really got them working together. 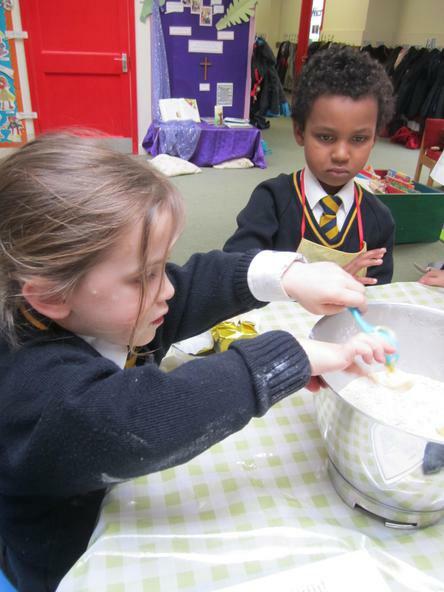 The children put their cookery skills to the test once again this week making pancakes. 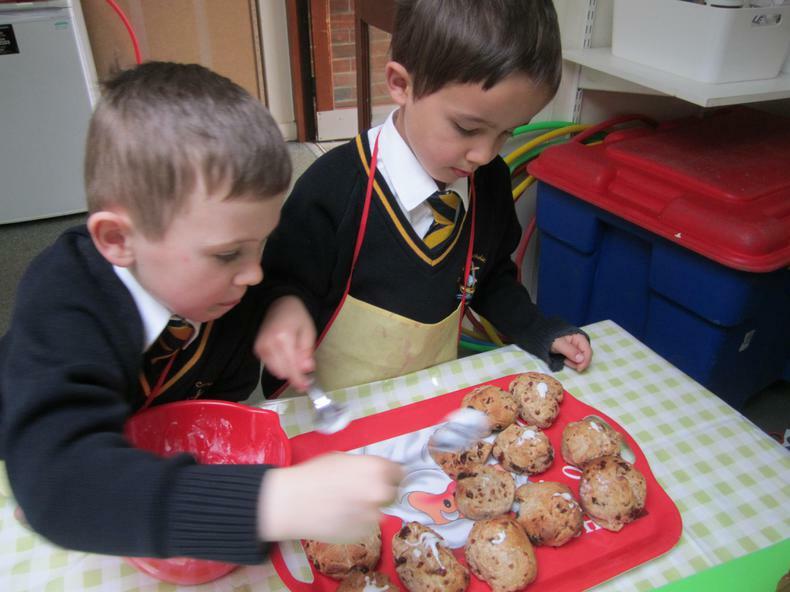 They learnt how to break an egg, use the lemon squeezer, whisk the batter and use the blender. 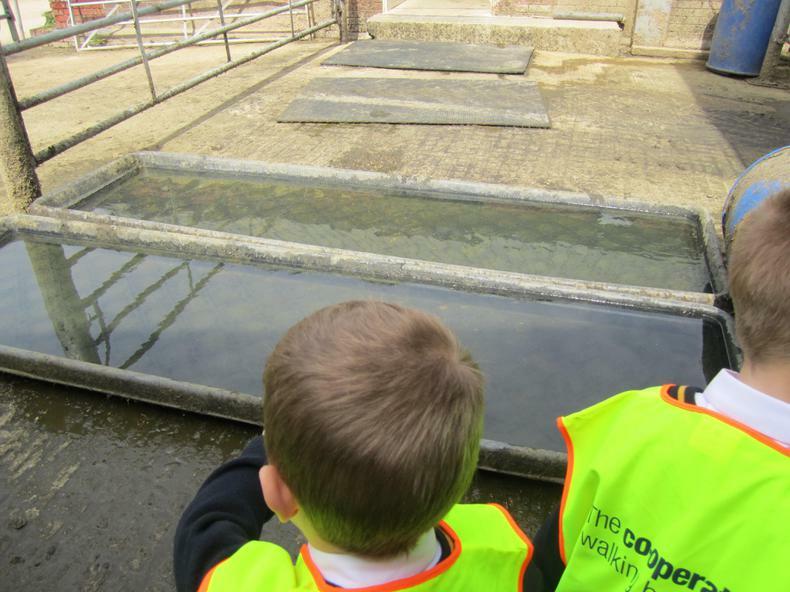 They were fascinated to see how the mixture changed as it went on. 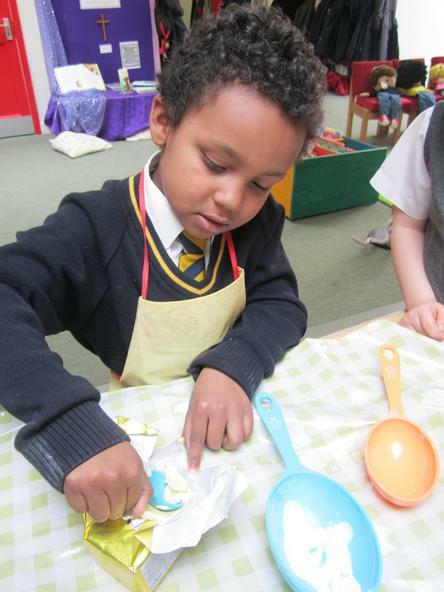 Joseph decided it looked like "porridge" at one point, and Samuel C noticed how the sugar changed when it was sprinkled onto the lemon juice. How do you like your pancakes? Rolled or flat? Which topping do you like best? 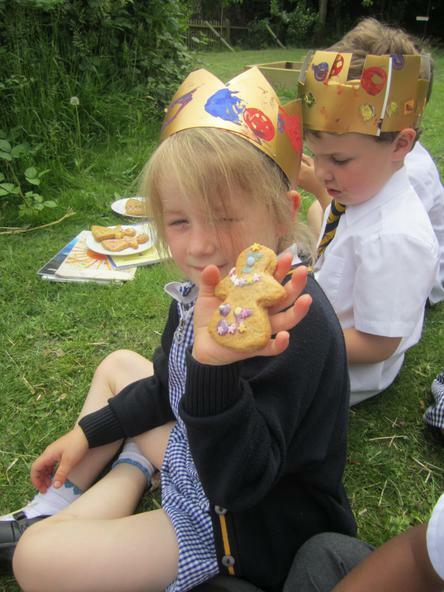 The children chatted about all of their preferences as they enjoyed eating them together. 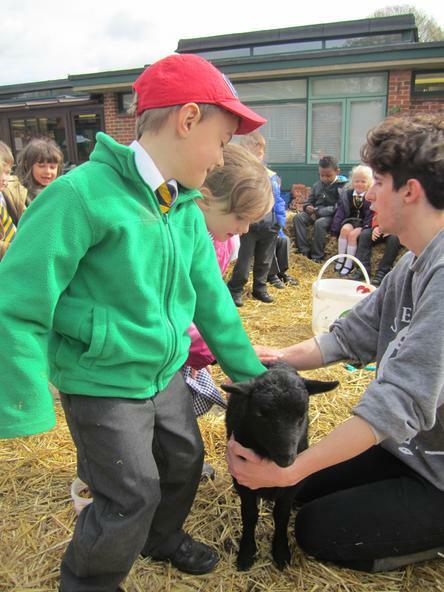 Our School Nativity "A Present for the baby". 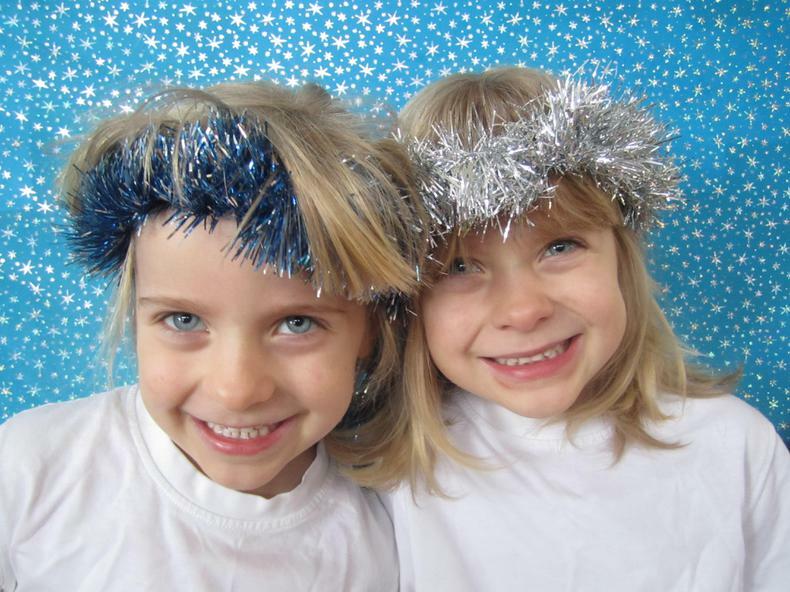 As we get ready for Christmas we have been thinking about what "Advent" really means. The children made an advent wreath and we have been lighting the candles each day as we get closer to Jesus's birthday. 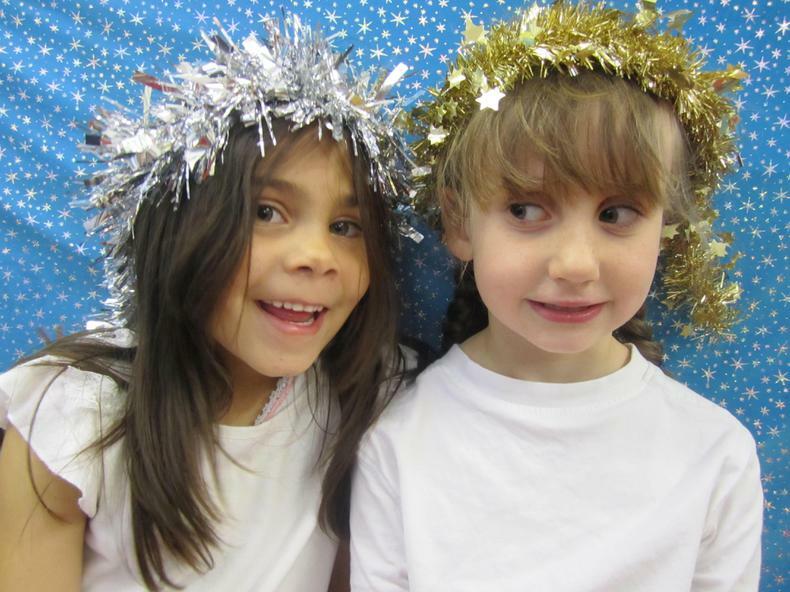 Our Christmas play is called "Presents for the Baby", and the children have been talking about what gift they can give to God throughout Advent as we prepare for Jesus's birth. 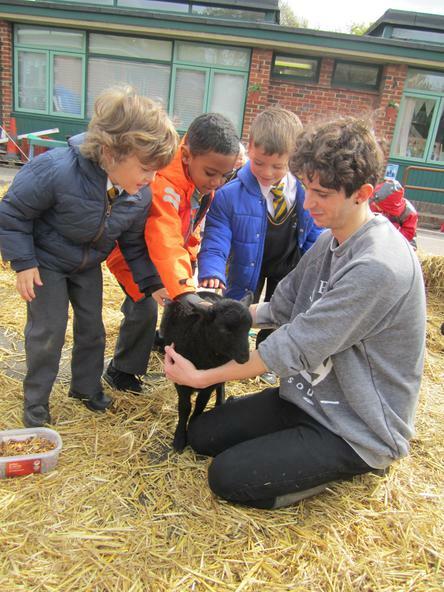 The children are learning that they themselves can be the gift and that what they do is important. 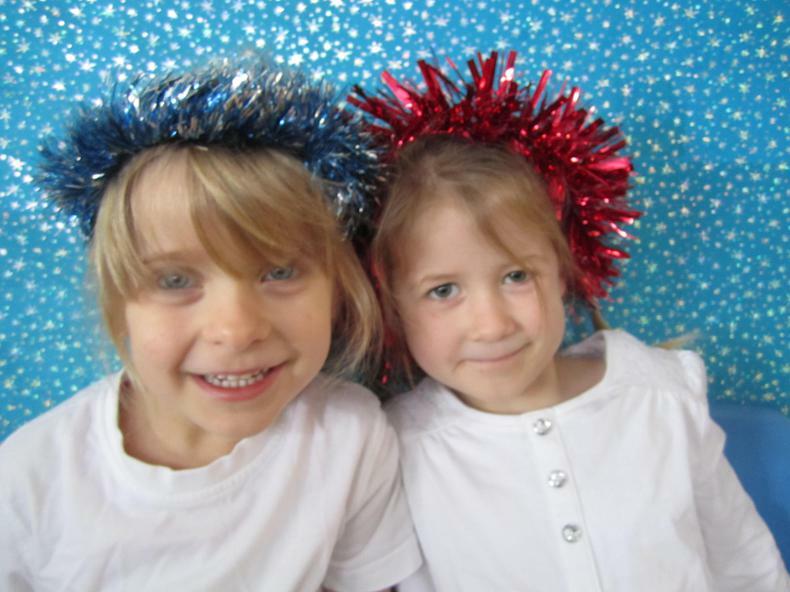 We made our very own class Advent calendar with the children themselves as the pictures on the front of each door. Inside is their own idea of something special we can make an extra special effort to do for that day. When it's their turn they hide inside a giant gift box and we sing our special song and at the end they burst out of the box and tell us what's behind the door. They came up with fabulous ideas - not just remembering to say please and thank you but to say "Your Welcome" too, or to play with someone you don't know. We do this to the Fraggle Rock song "Pass it on" - you could look it up. The children love singing it, but we really focus on what it means. Every day we read all or part of the Christmas story, but why do we have a Christmas wreath and light candles at all? Sonny told us "We have candles because it's a special time"; Harry told us "We light candles for our birthday - it's Jesus's birthday"; Nicholas told us "We are getting ready for Christmas"; and Alejandro explained "I like candles - my Mummy lights lots of candles at home...we remember Mary, she's Jesus's Mummy." 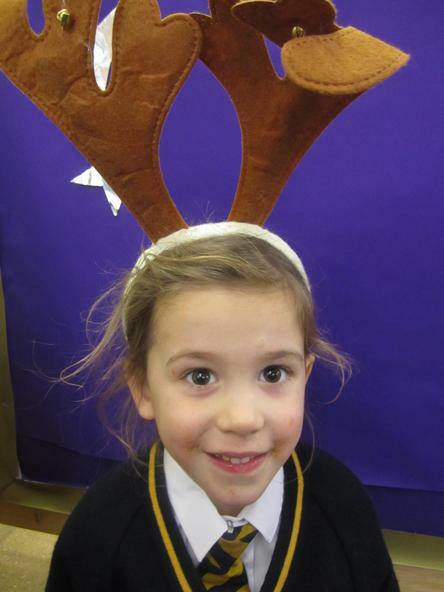 As we get ready for Christmas we have have been reading "The Jolly Christmas Postman" and at the start of December we went down the road to the Post Office in Broadlaw Walk. We met the Post Mistress who showed us how she weighs and sorts the mail. We met the postman with all his letters in his trolley and watched him post them into the letterboxes for the flats. The children decided what they wanted in their own Post Office back at school and have been busy buying stamps using 1ps and 2ps and 5p for a parcel. They have been exploring using the balance scales, weighing the presents before they pop in the sack, and with a "Ho ho ho" they've been Father Christmas taking the parcels off to Santa's workshop else where in the classroom! 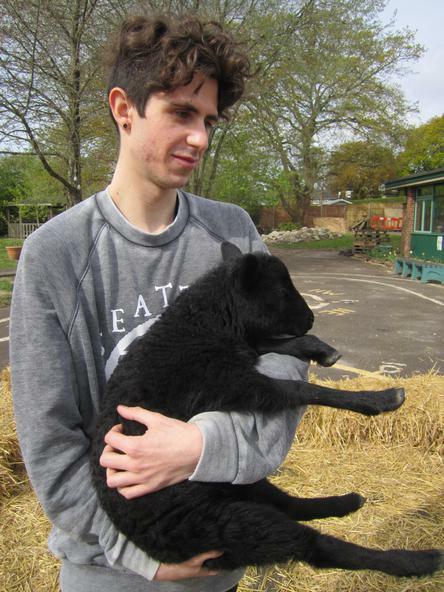 and of course "They all lived happily ever after." 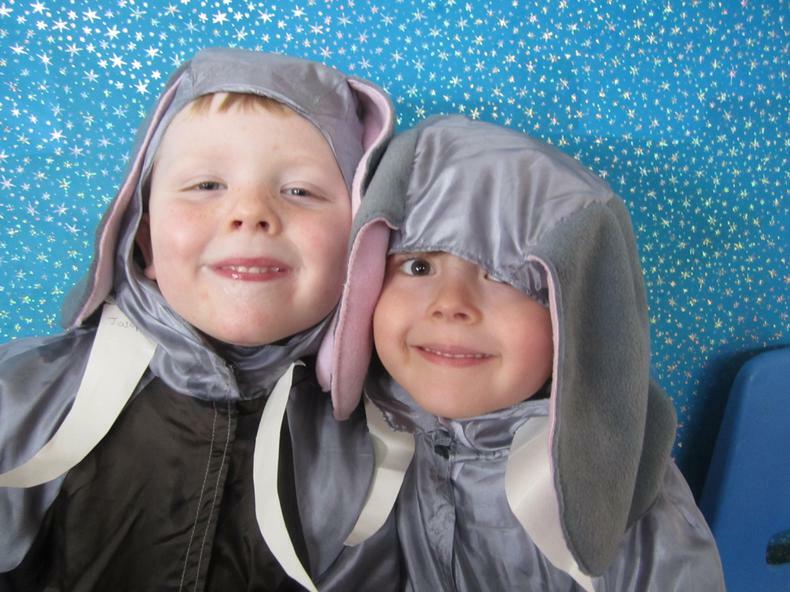 Every day we would retell the story so the children got to know it really well. 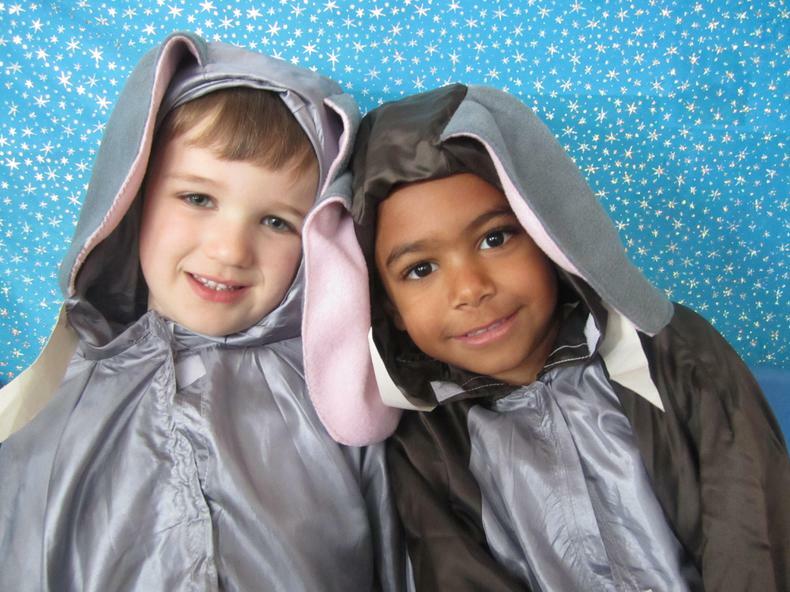 It has helped them to think about the language used in stories and the sequence of events. 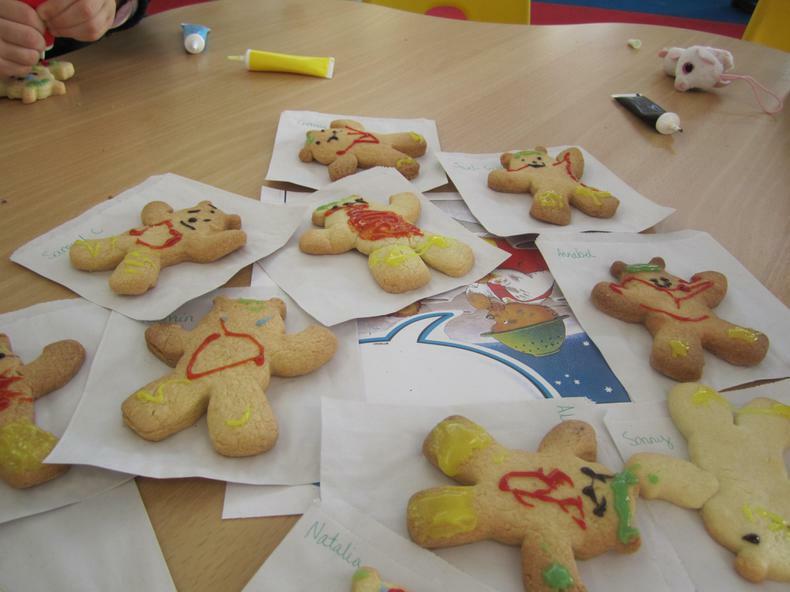 The children made teddy bear biscuits and iced them to look just like Baby bear in his wellies and with his colander helmet. 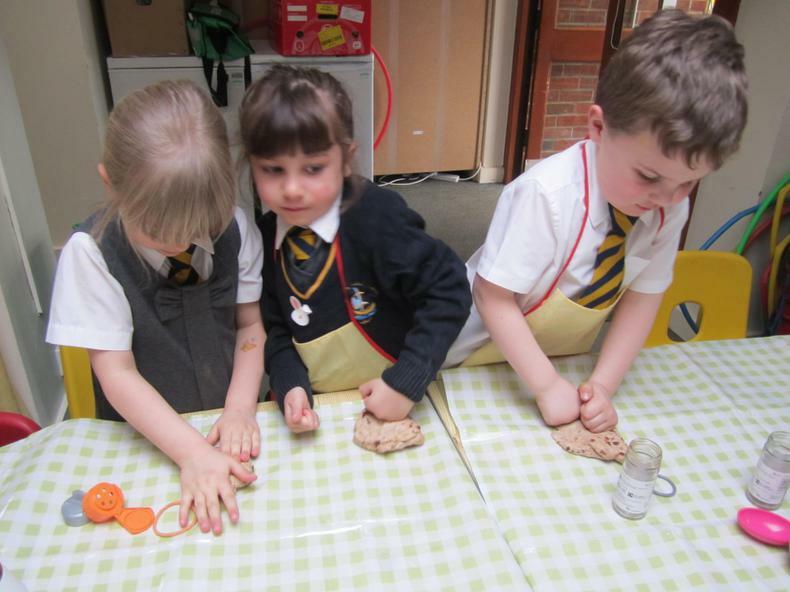 All of this really helps the children develop their fine motor skills as they mix, roll and cut the dough and then as they ice the biscuits. 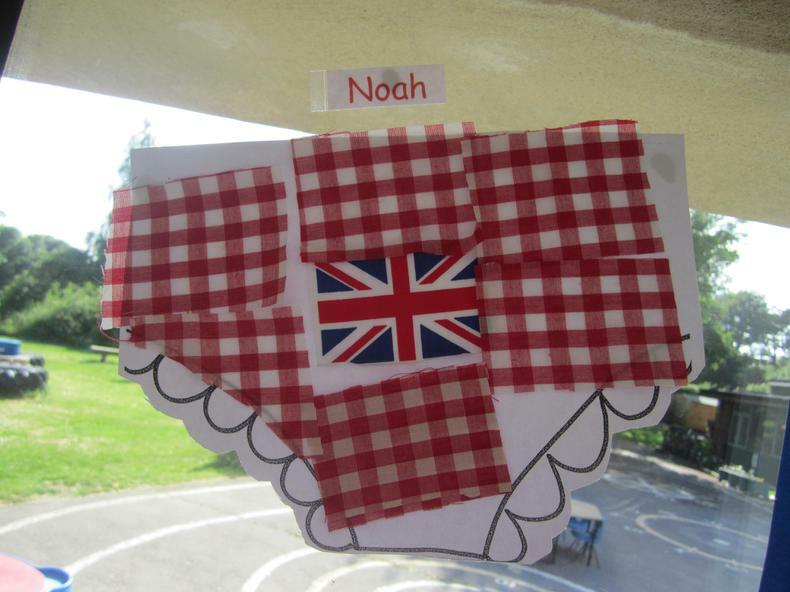 They are not just playing at having a picnic they are using their imagination and developing their vocabulary; they are also learning to work together. 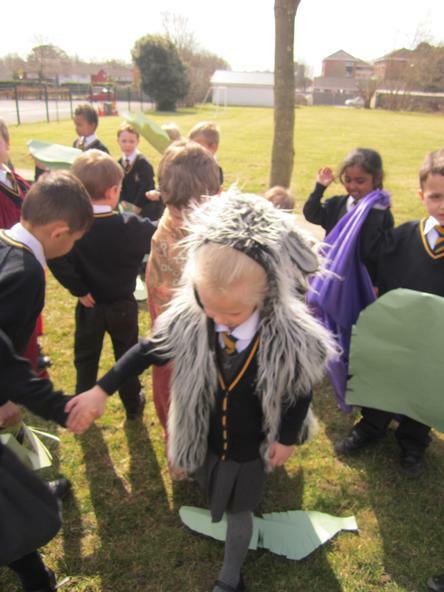 The children had a wonderful time having fun making their own picnics and flying off to the moon in their very own rockets, pretending to be Baby Bear and the owl, retelling the story again and again with each other. 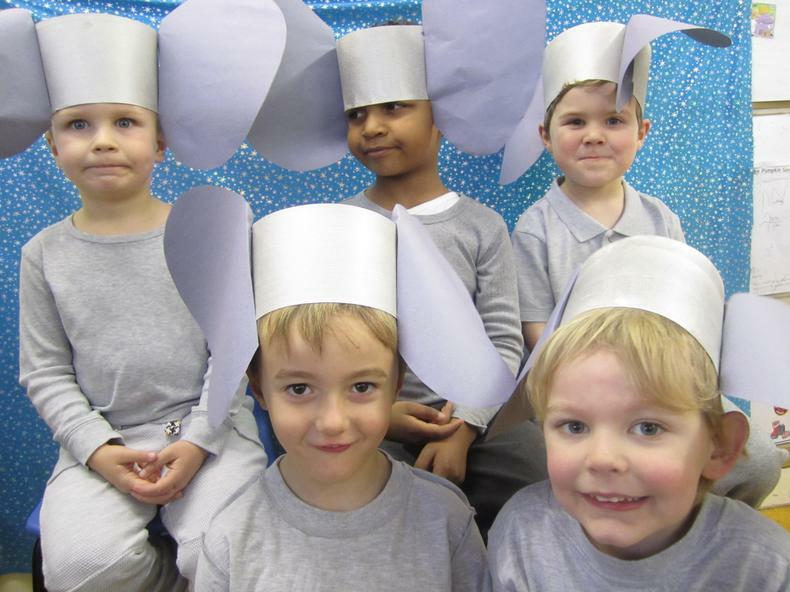 After half term the children have been talking a lot about transport, and the boys especially love cars and making rockets out of mobilo, junk and giant polydron. 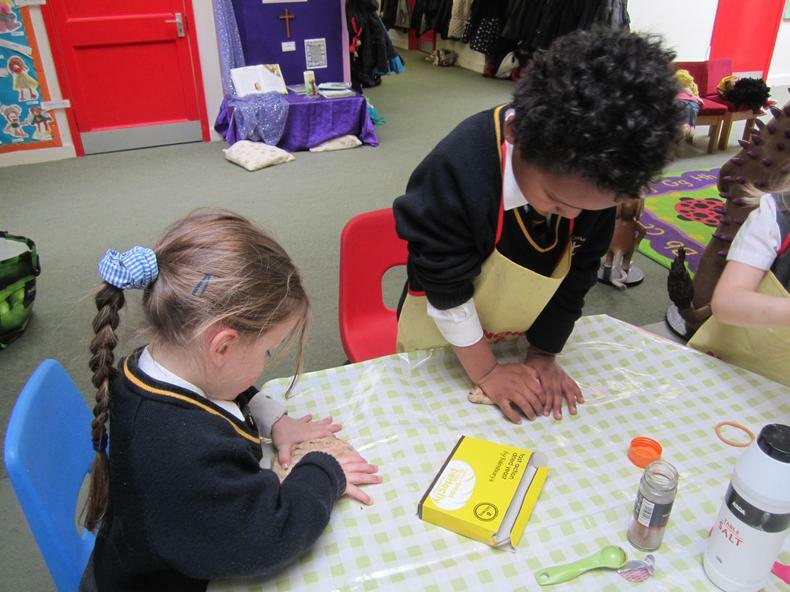 It's brought lots of opportunities to learn how to join things with glue and learning how to use the sellotape dispenser safely and independently. The children made some amazing fire engines complete with wheels, ladders and sirens. As a class we have been thinking about the different kinds of behaviours we need to help us as learners. 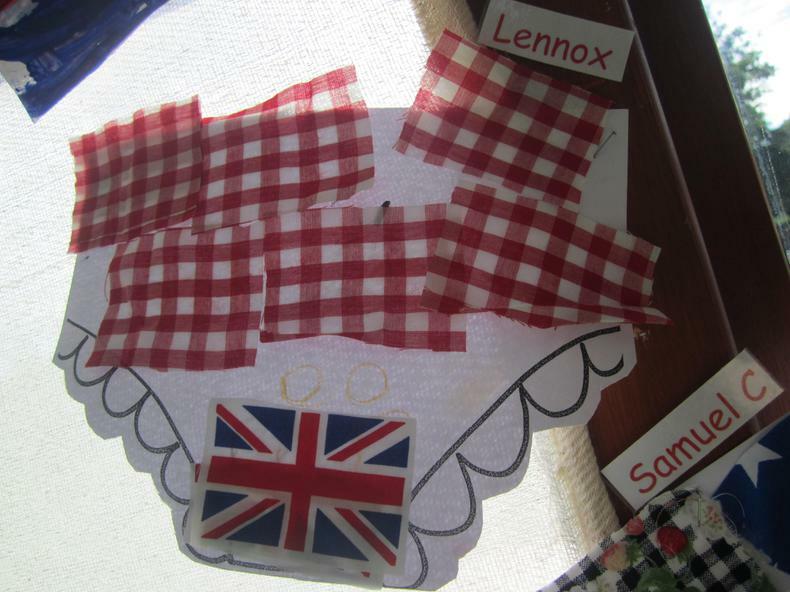 Last half term we were thinking about independence. 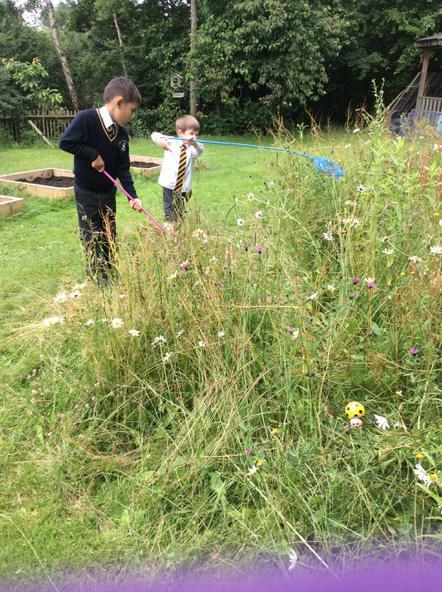 This half term we have been thinking about Collaboration and the children understand this means working together, and we can do this at tidy up time and sharing ideas. The class love the giant polydron and have worked together to make houses, rockets, rockets and even a chocolate factory! They even made a house with a door that really opened! 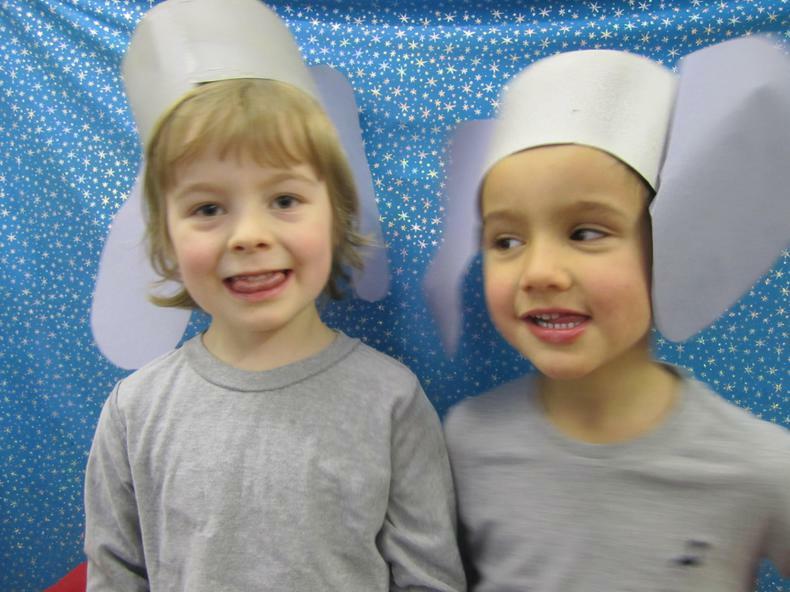 Collaboration means sharing ideas and Harrie and Samuel then made fantastic helmets out of the polydron. Samuel told us "My helmet's got a walkie talkie! These bits light up in the dark, and this ones so I can get some signal so I can phone - and I can take it off really easily!" Harrie told us about hers - "My helmet's for an aeroplane - and this is the steering wheel. It covers my head in case I bump it!" 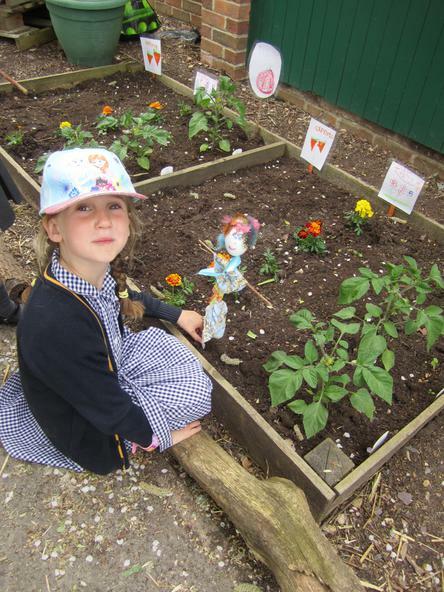 As September ends and October starts the children continue to love to play outside and quickly found the runner beans in our vegetable patch and spent a lot of time picking beans before stringing and cutting them. 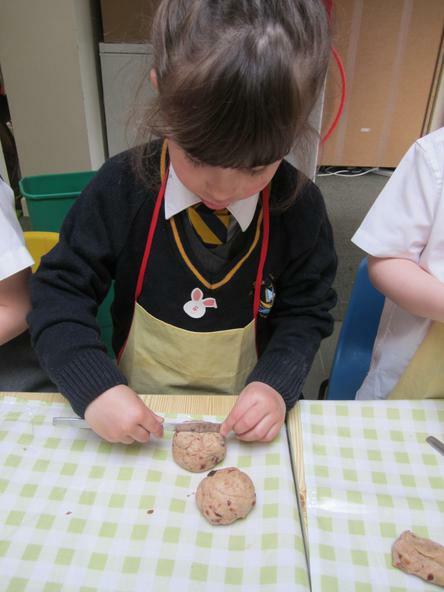 The beans were then cooked and the children all were able to have a try and see just what they tasted like. 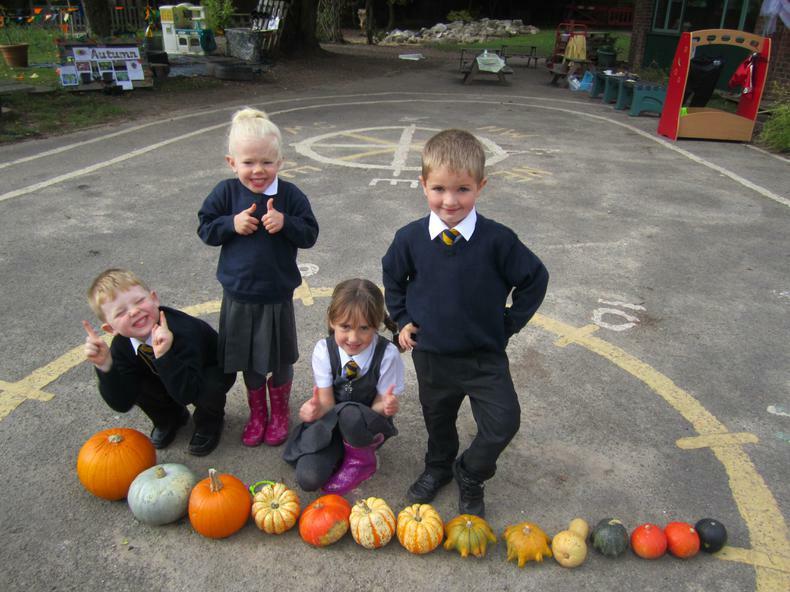 Just before half term all sorts of pumpkins magically appeared in our vegetable patch. 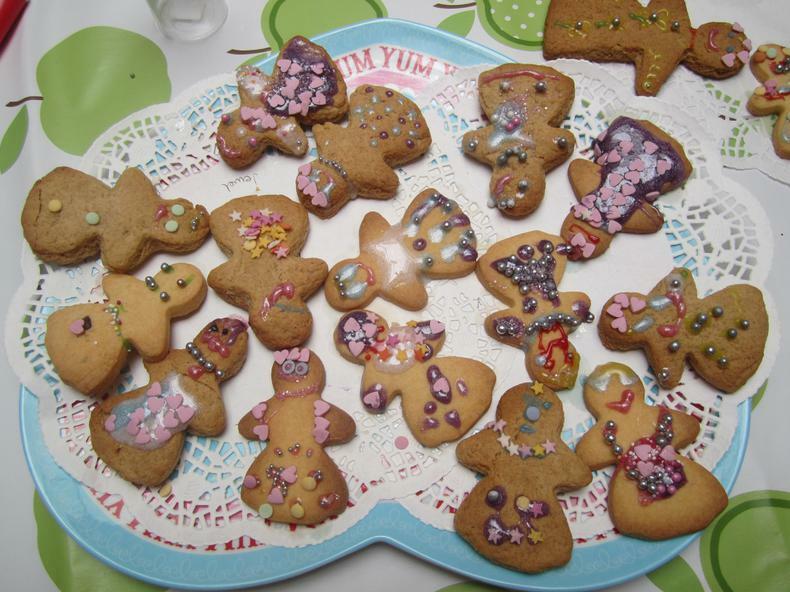 The children busily weighed and sorted them by colour and ordered them by size. 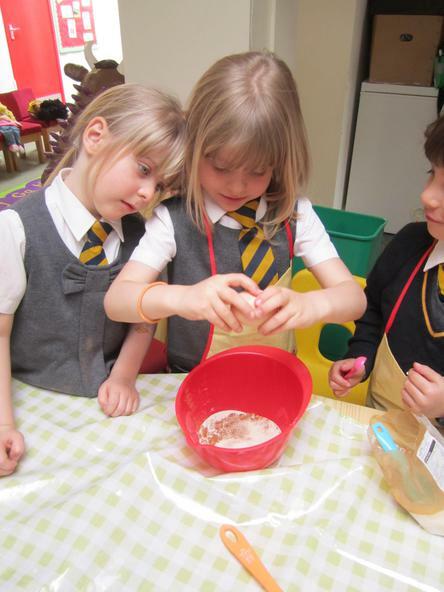 Then after reading “Pumpkin Soup” by Helen Cooper we made our own. 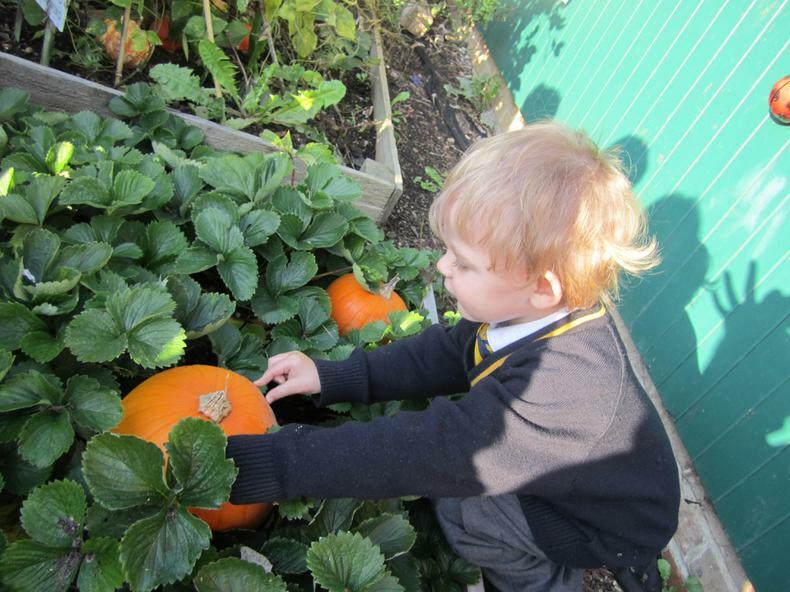 The children helped to peel the pumpkins and scoop out seeds before grating cloves of garlic and adding cumin and coriander. 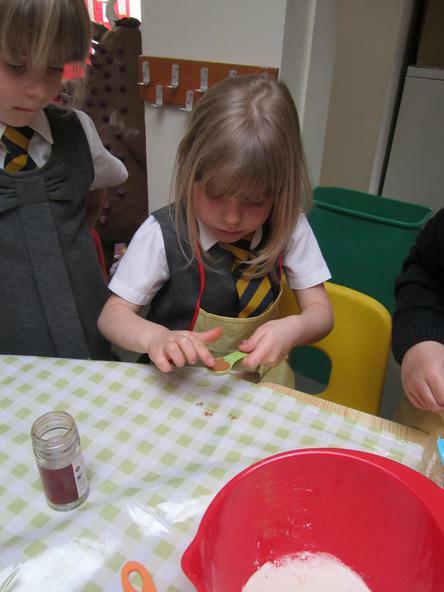 Most of the children were not at all sure what celery was so we spent time chopping, smelling and tasting it. 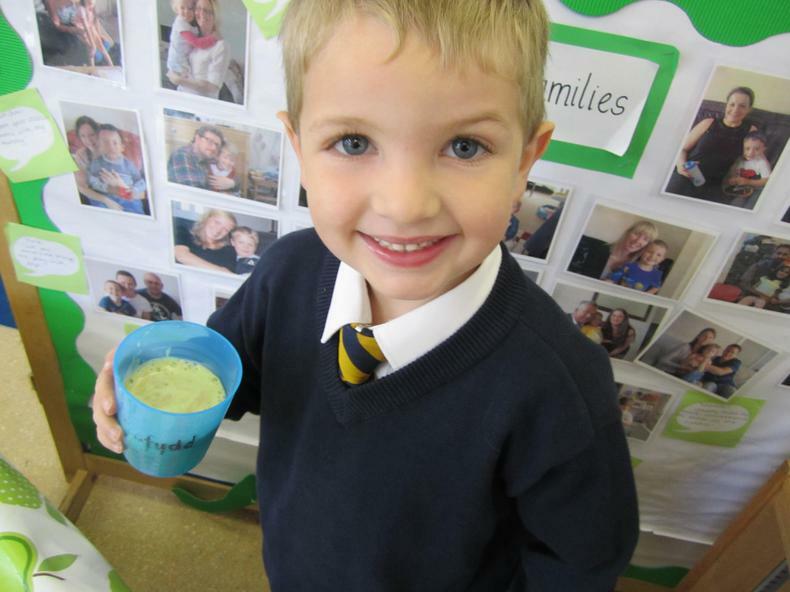 Despite lots of “fussy eaters” nearly all of the children tried our lovely soup - we were really proud of them! Even our home corner turned into a giant pumpkin and the children have really enjoyed hearing more Helen Cooper stories about the naughty duck and his friends in the book “Delicious”, and it’s given the children the opportunity to begin to use the sounds they’ve learnt and add tasty words to bowls of imaginary food. Lots of autumn fruits came for snack time so the children could choose which ones they wanted to use to make a healthy juice. 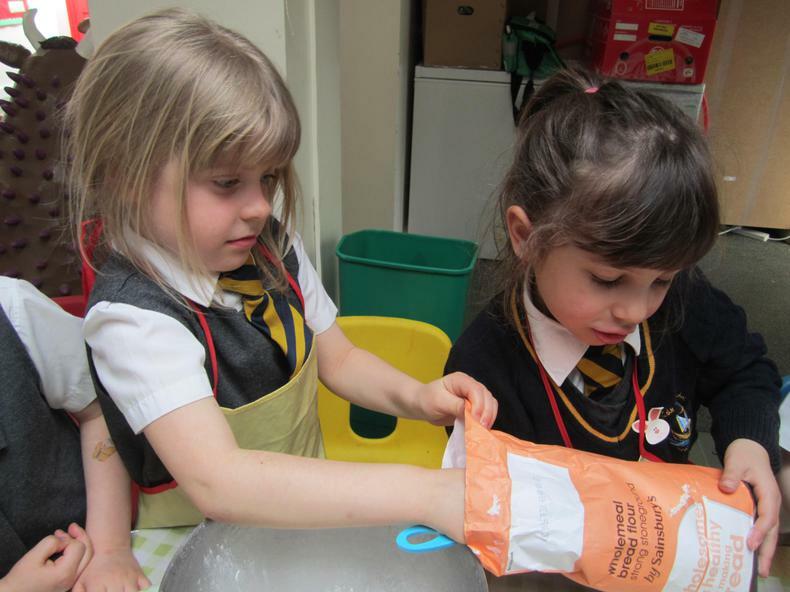 We always use cooking as a great way to teach maths, so the children had to think carefully about the order they would put the fruit into the juicer, which would be first, second and third? Using the juicer was easy and very exciting to see what how the fruit changed and what colour the juice would be. 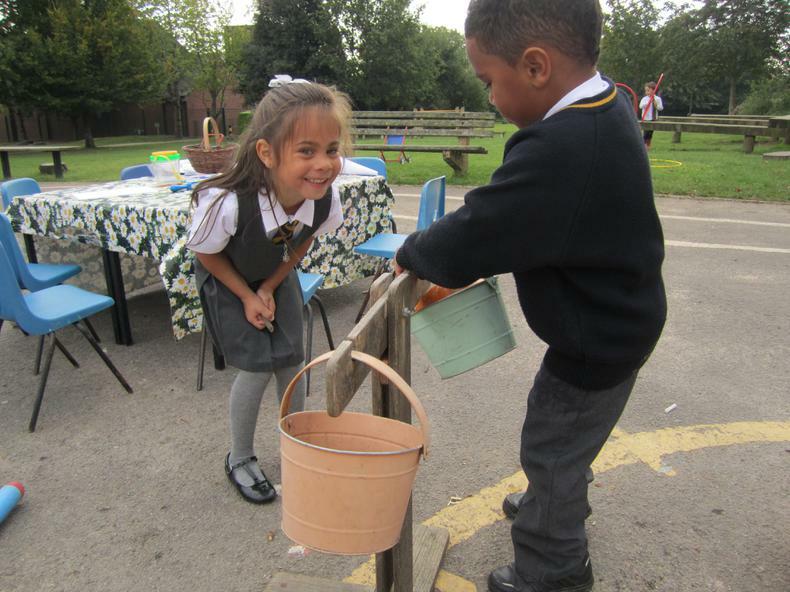 The children loved seeing the autumn season develop and the opportunities it brings to collect conkers and acorns. They’ve have used them for counting and making patterns. 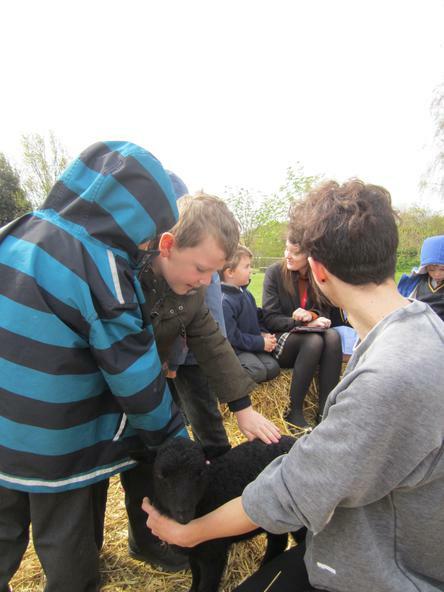 All the things we found were great additions to their own cooking in the mud kitchen, and so the children were able to make the most of the last of the autumn sunshine. 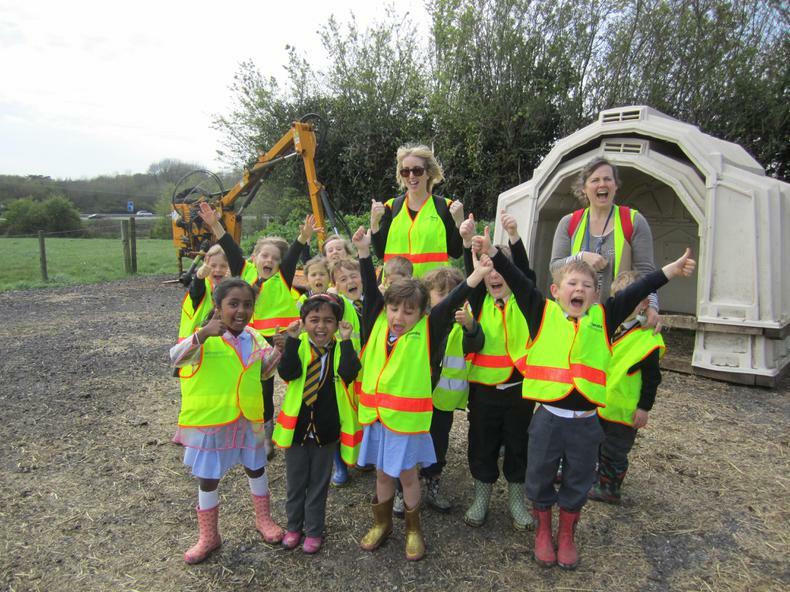 They have particularly enjoyed the construction area and have had a great time exploring mobilo and giant polydron. They’ve really enjoyed working together to build things.